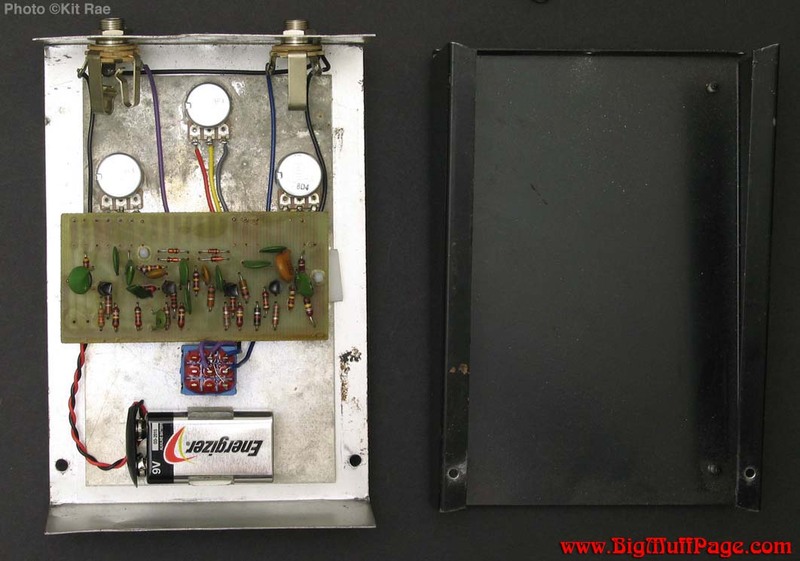 Since its creation in 1969, The Big Muff Pi has been a very popular pedal, and as with many other popular pedals from the late 1960 and '70's, other companies wanted to cash in on the sound. 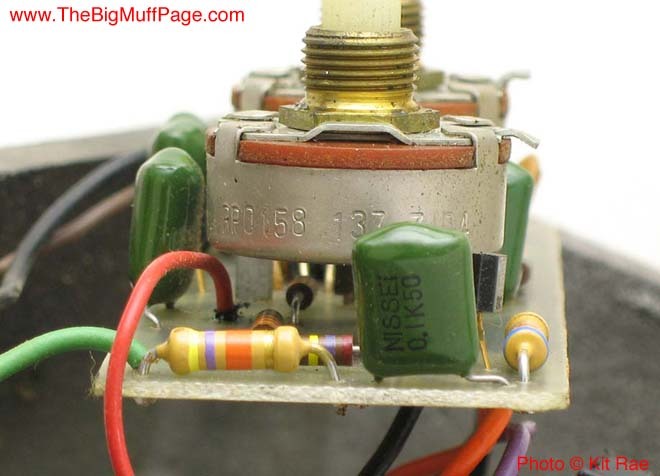 Within a few years of hitting the market, the Big Muff was being cloned by both minor and major manufacturers, including Jen, Sola Sound/Colorsound, and Ibanez, and it is still being done today. Some of these were exact knockoffs of the circuit, and others featured some interesting and unique modifications. 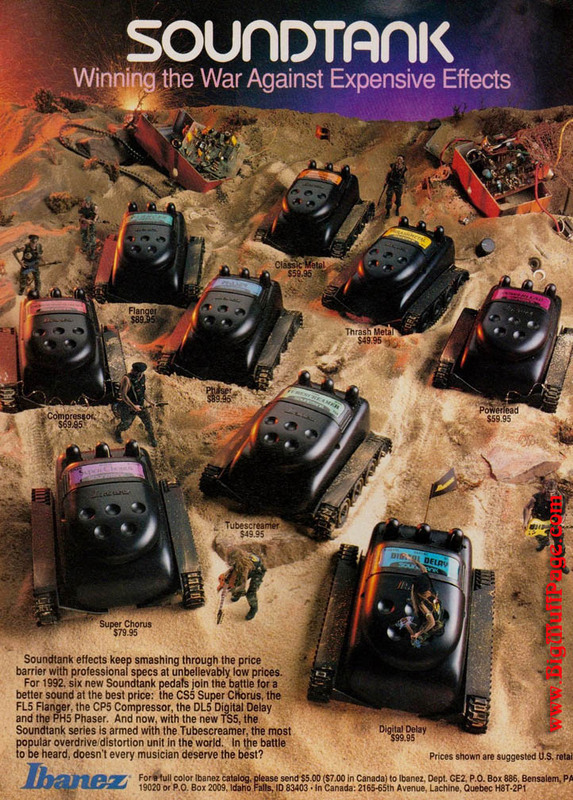 Some were made with similar enclosures and control names, giving away their heritage, while others were so different in appearance and controls that it took years for people to realize they were actually Big Muffs. 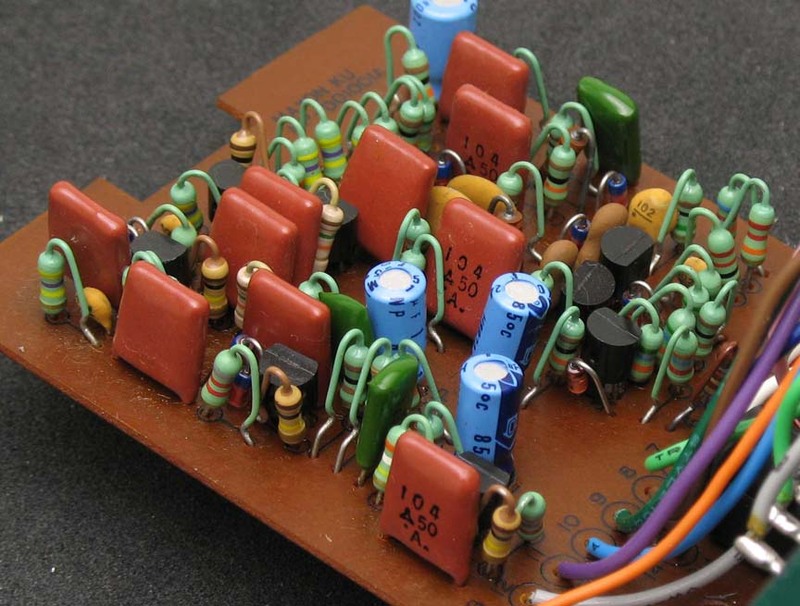 Cloning another company's circuit was nothing new back then or today, and many of these knockoffs showed the wider range of uses that could be aplied to the circuit to expand the tonal vocabulary. If you have any information about Big Muff clones not listed here, or additional info to help improve these articles, please email me using the contact at the bottom of this page. 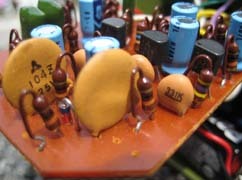 Designer: Bob Myer is the original Big Muff circuit designer. 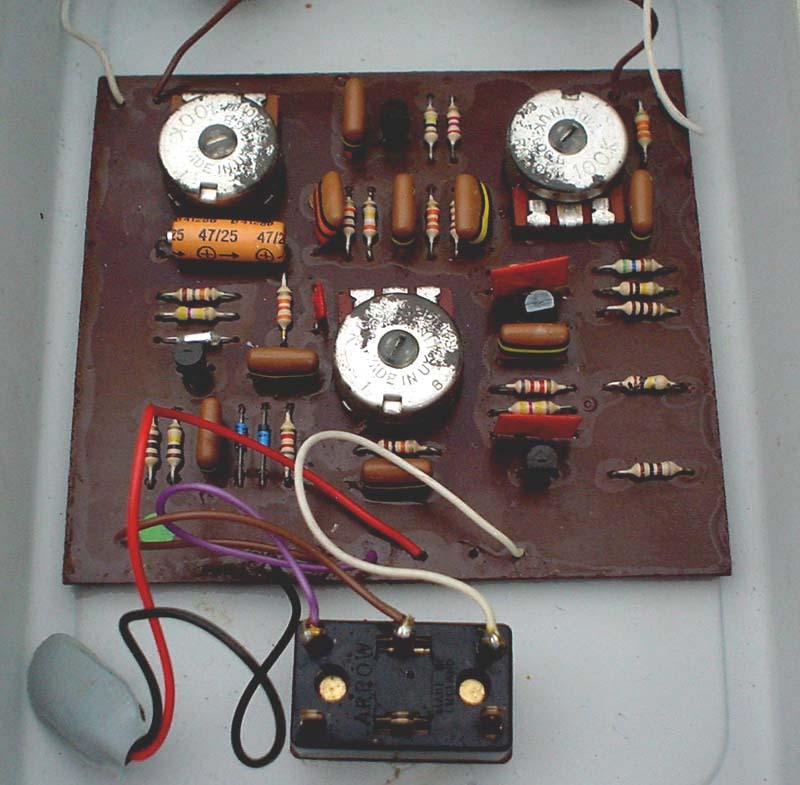 George Cole created this modified clone of that circuit. 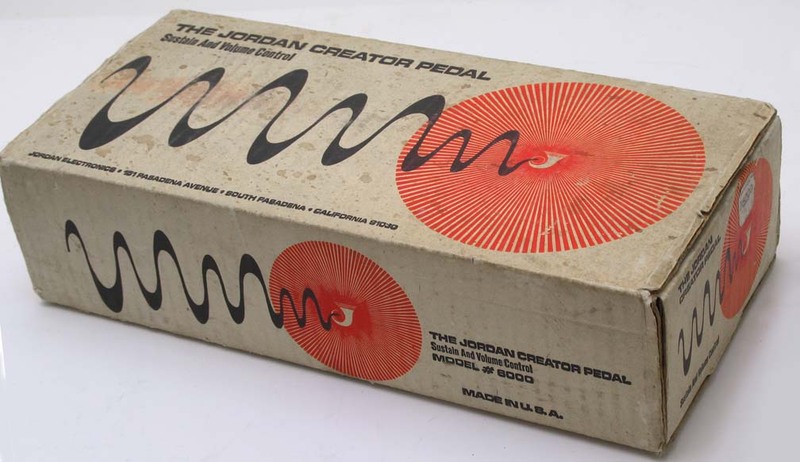 Around 1971 a pedal with a circuit nearly identical to the Big Muff appeared on the market, the Jordan Creator. 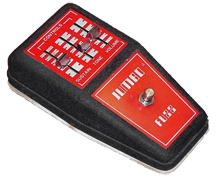 It was manufactured in the USA by Jordan Electronics, a small California pedal effects company owned by Victoreen Instrument Company. 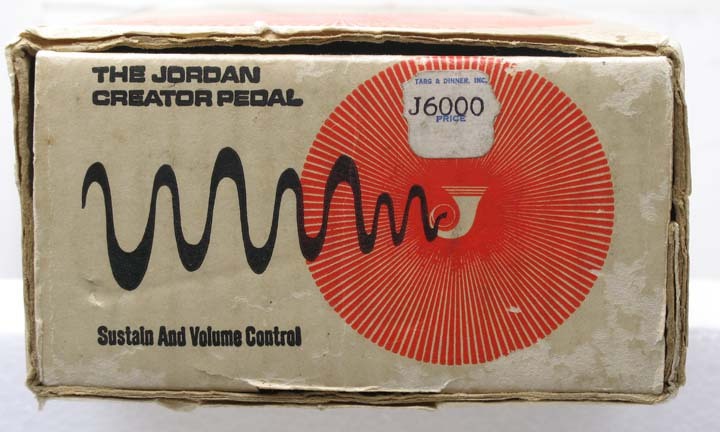 Jordan made a line of very loud solid state amplifiers beginning in 1966, and a host of other non-musical electronics equipment, such as radiation detectors. 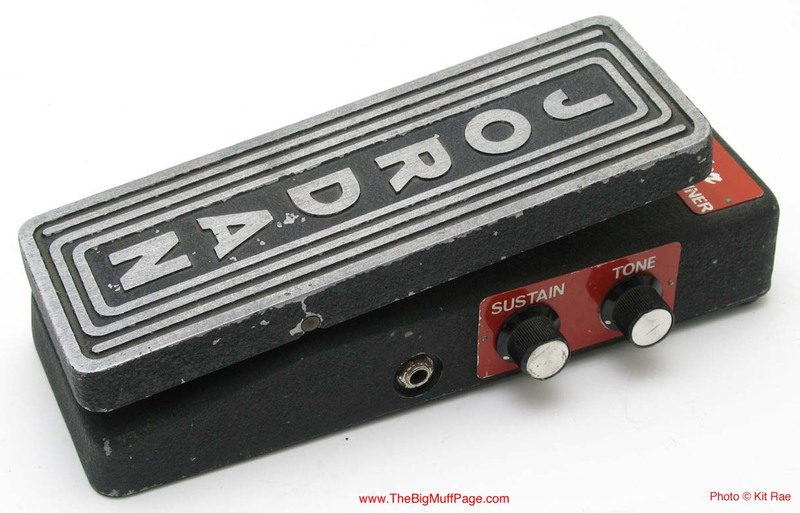 There is not much infomation available about Jordan, but their amplifiers were very well know among musicians in the 1960's, being used by The Yardbirds, The Doors, and the Mamas and the Papas. 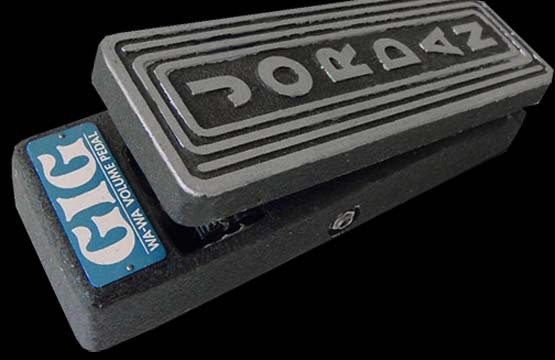 Jordan got into making effects pedals in the late '60's, and are most well known as the maker of the popular Boss Tone, an effect pedal that plugged directly into the guitar input jack, similar to early E-H pedals. Sometime in the late 1970's the company was disolved, and owner George Cole and engineer Bob Garcia went to work for Rickenbacker. Supposedly one of the employees of Jordan brought in a Big Muff Pi and everyone in the shop loved it. 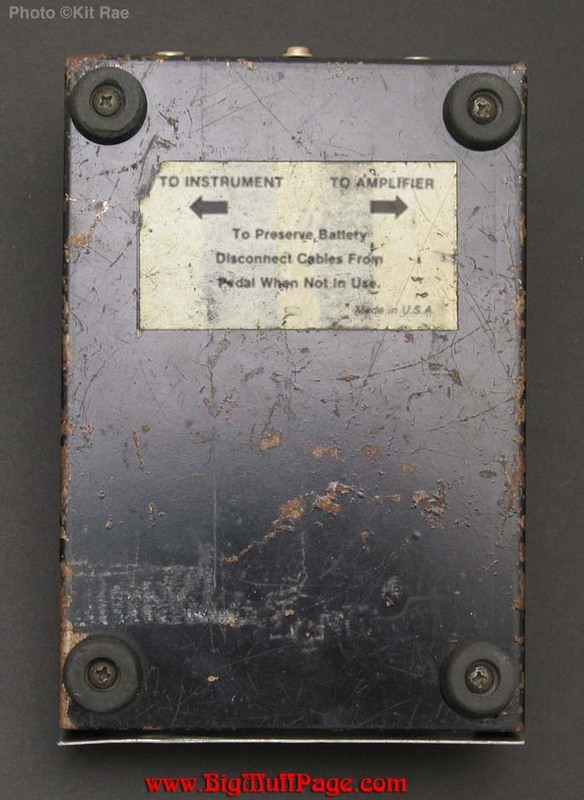 George Cole made some modifications to the component values and the Creator Volume Sustainer (model #6000) was born. Bob Garcia, Jordan's chief engineer may have also been involved. The pedal is very rare, and was possibly the very first clone of the Big Muff. 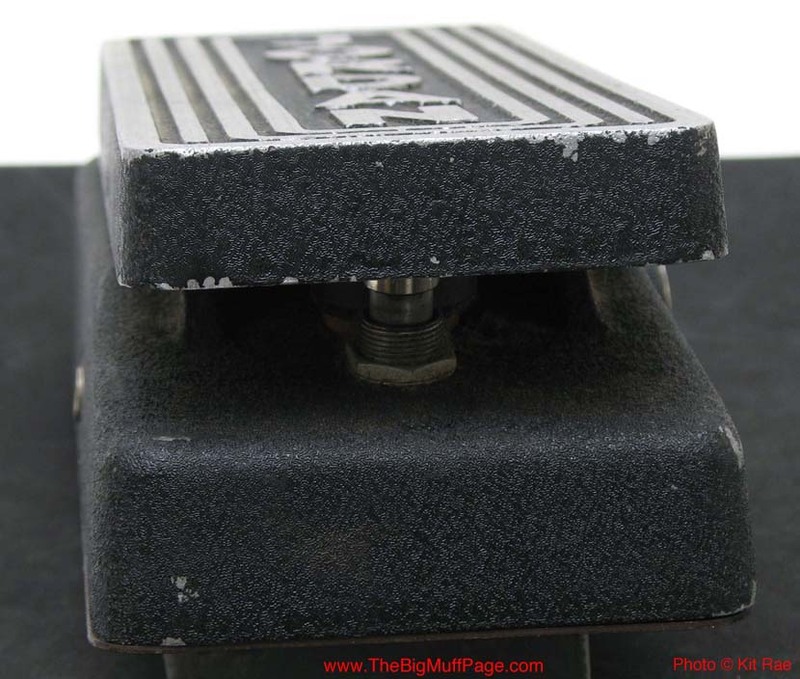 It was housed in a large die cast aluminum foot pedal enclosure that resembled a wah pedal. In fact, Jordan used the same Mexican made enclosure for their Gig Wa-Wa pedal just prior to the Creator. It also housed their Vibrasonic Vibrato. 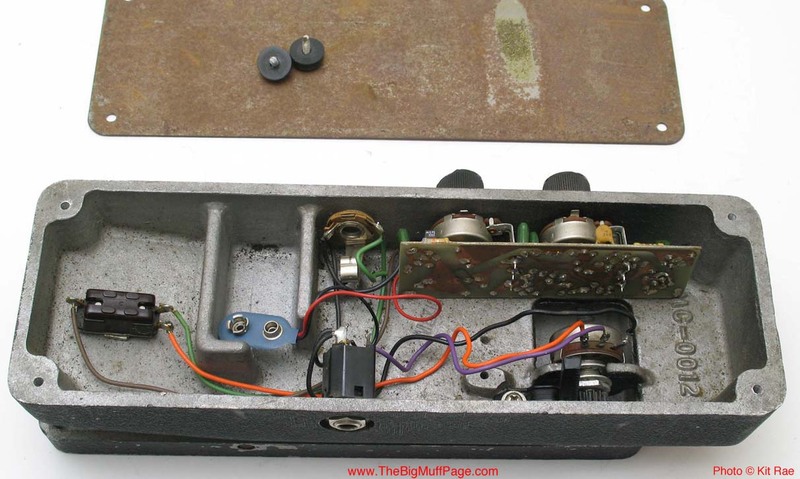 The pedal featured Tone and sustain knobs on the side, a foot pedal to control the volume, and a bypass switch under the heel of the foot treadle. Rocking the treadle forward raised the volume, but even at maximum the volume was barely at unity, making the treadle a bit useless. 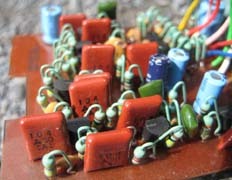 The circuit was basically a straight rip off of the Big Muff four stage transistor circuit, but some of the cap and resistor values were modified well outside the range E-H was using in Triangle Big Muffs from this period, giving it a slightly different tone than many of the real Triangle Big Muffs being made at the time. To my ears, the sound rivals many of the Triangle Big Muffs I have played, with perhaps a bit more biting distortion sound. 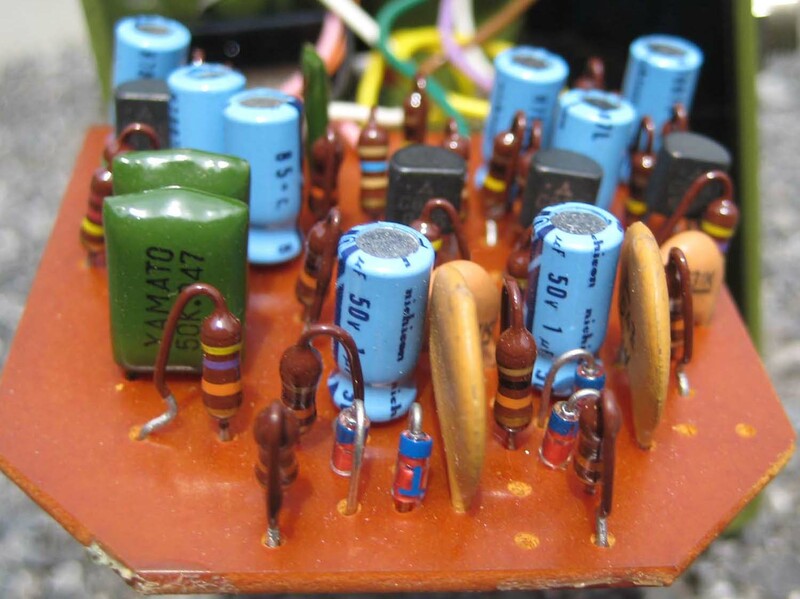 The Creator was likely first manufactured in 1971, more than a year after the first V1 Triangle Big Muffs hit the market, so it appears this was one of the first, if not the first, clone of the Big Muff Pi circuit. 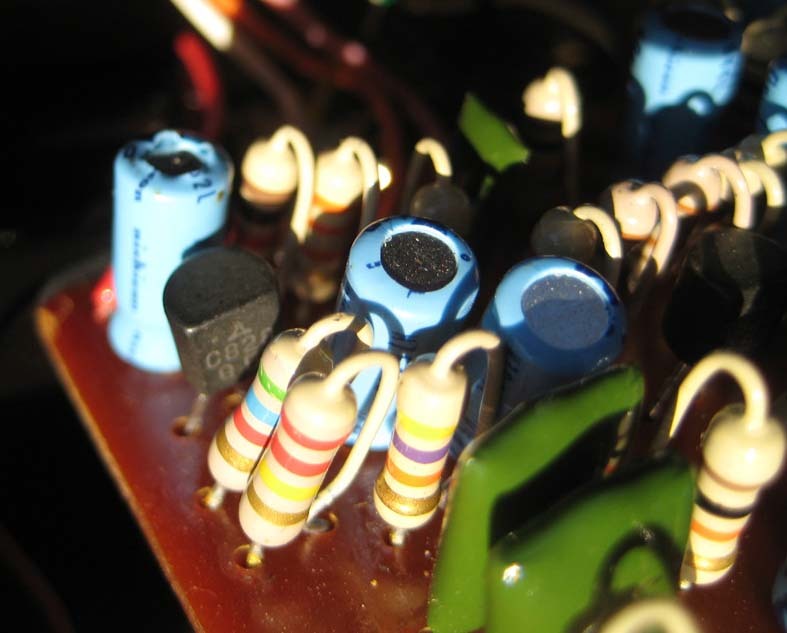 The feedback/filter caps in the two gain stages varied from 500pF to 560pF, just like the real triangle Big Muffs. 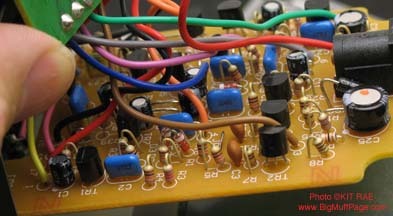 The low pass filter at the input stage was removed, as was done on some early Big Muffs. Feedback resistors were low 220k to 270k, values very uncommon in real Big Muffs. Many of the other resistor values were uncommon as well. 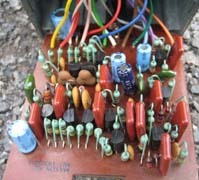 The input, coupling , and clipping caps were all common .1uF. 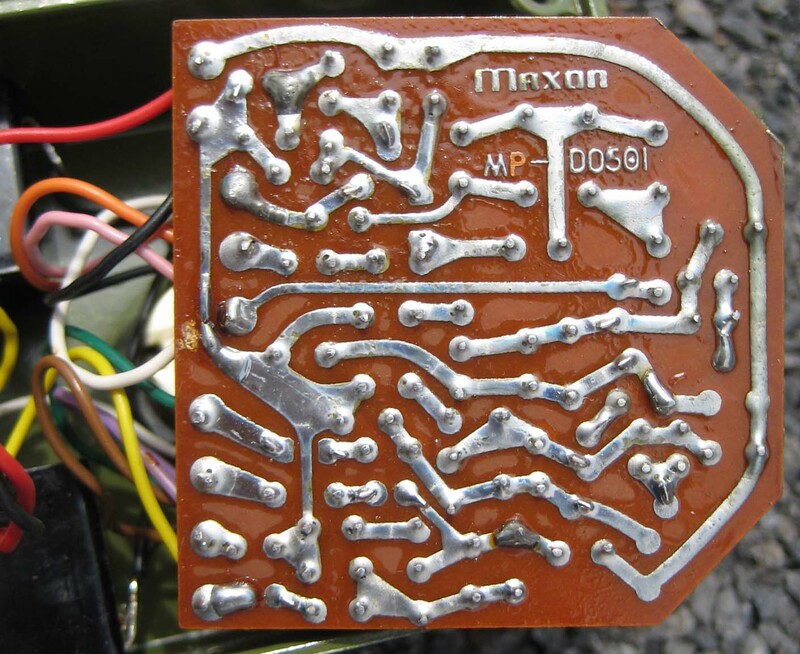 Diodes were Silicon recifier type, and the Motorola NPN Silicon transistors were marked with a non standard number, Motorola SPS 3353, likely a special house mark created for Jordan. A modern equivalent is 2N5088. Some were PNP. (Thanks to Chris Martin for photos and Kurt for additional information, and Edkoppel for alerting me to one on ebay). See the fuzz pedal timeline here for more information about other fuzz releases from this era. The first clone I saw of the Jordan Creator was the Mahoney Creator. 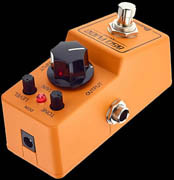 Chris Mahoney stated his version was based on the second version of the Triangle Big Muff. 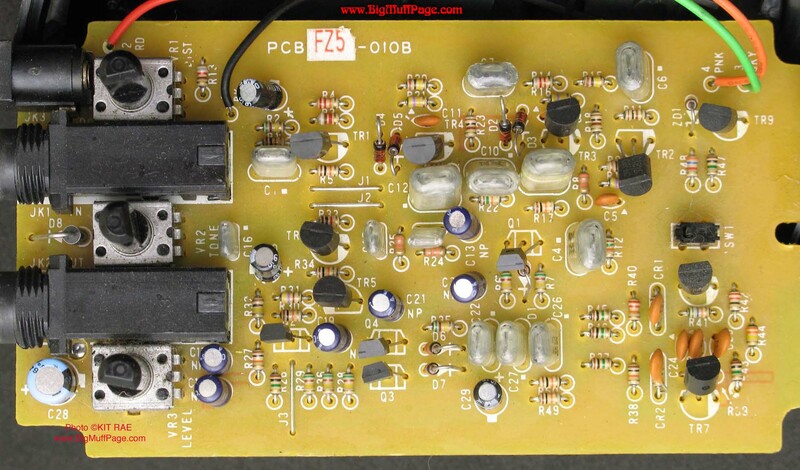 There was not just a first and second version of the Triangle Big Muff circuit, there about a dozen, but regardless, the real Jordan Creator does not have component values that exactly match any V1 Big Muff I have ever seen. The Mahoney version sounds comparable and features a mids knob not found on the original, and the pedals were signed by Jordan founder George Cole. Shown above - Another Jordan Creator with 1971 pots. On the middle-left is the Jordan Gig Wa-Wa, built into the same style cast aluminum enclosure. Note Targ & Dinner price sticker on the box. 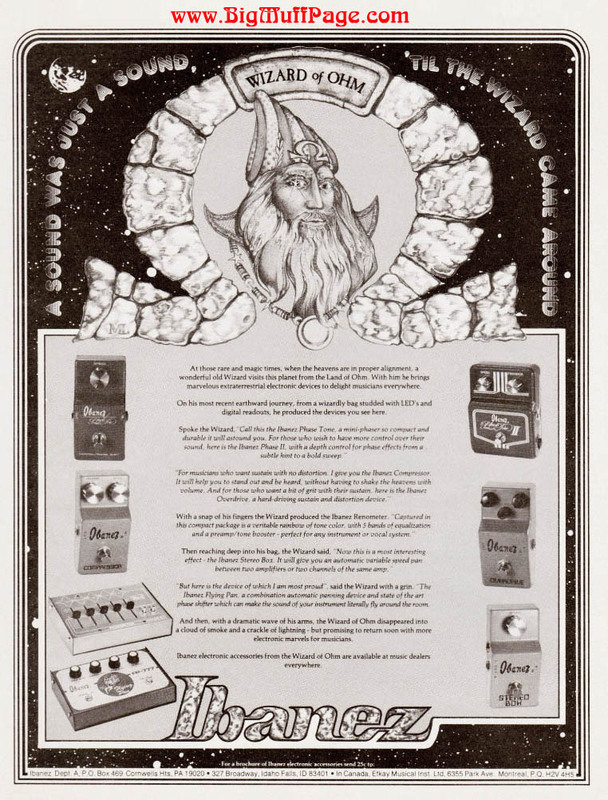 Targ & Dinner was a Chicago based wholesale musical equipment distributor and retailer, and would later have their own branded version of the Big Muff, the Marveltone Distortion Sustainer. 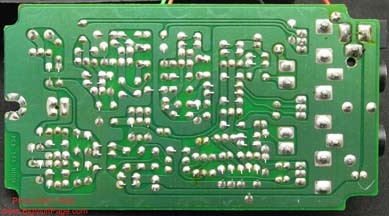 Shown above - A variant Creator circuit with 560pF feedback/filter caps, rather than 500pF found on other examples. In the mid 1970s an exceptionally good sounding Big Muff clone appeared on the market in the USA, the Hohner Tri Dirty Booster. 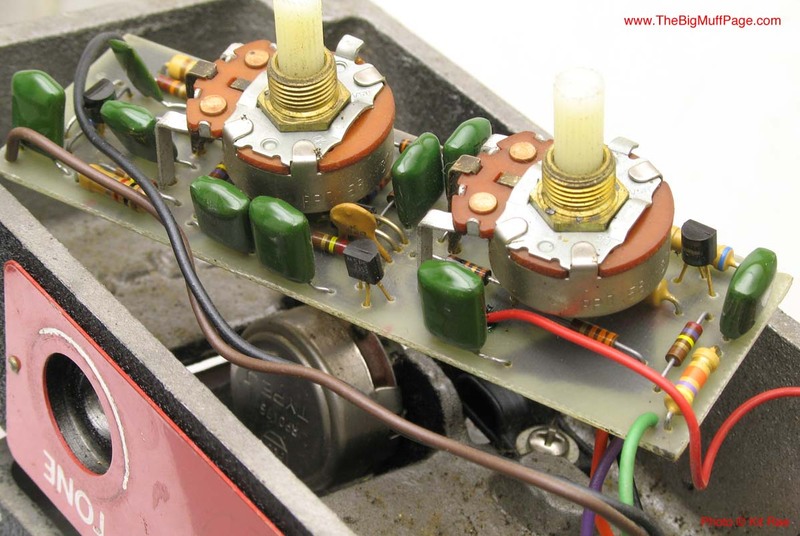 The Tri stood for Triangle, as the V1 Big Muff had come to be known due to the triangular knob layout. Hohner had been around since 1857, known as one of the worlds largest accordion and harmonica manufacturers. Hohner branched into making keyboards in the 1940s, electric guitars in the 1950s, and acoustic guitars in the 1970s. 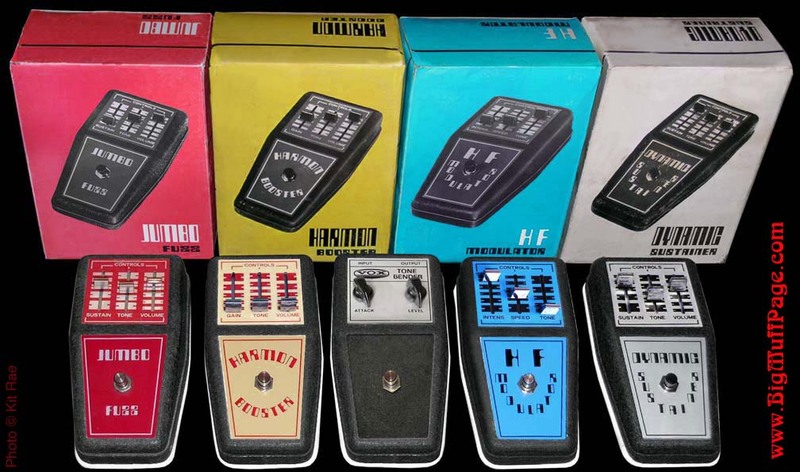 As many other companies were doing at the time, Hohner also branched into the effect pedal business in the mid 1970s. 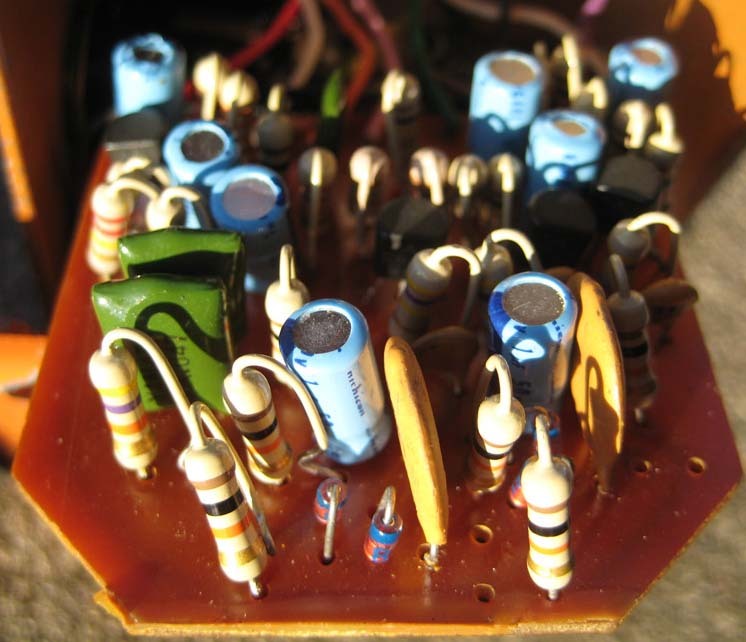 These included the Sound Modifier Series, the Dirty Booster Overdrive, and the Tri Dirty Booster, which was essentially a straight clone of an early Big Muff with an extra capacitor in the tone section. The circuit was likely cloned from one example of a V1 Big Muff, though the particular circuit copied had a very good set of component values. The Hohner TDB sounds superb and rivals the best examples of the real V1 Big Muffs. I have seen a few examples of these with slightly different capacitor values, but overall they seem to be identical. Most have a 470pF cap in the first stage, and 500pF caps the two gain stages. The extra cap in the tone section is a bit of a mystery. I assime it was added to alter the tone range on the bass side, but I cannot hear much of a difference with or without it. 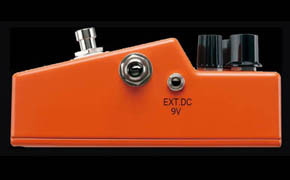 At first glance this almost appears to be an OEM version of the V1, but this was not made by Electro-Harmonix. 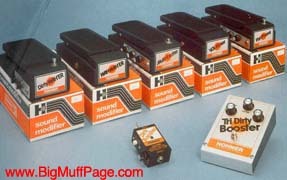 The manufacturer Hohner contracted to make these pedals in unknown, but it was made in the USA. 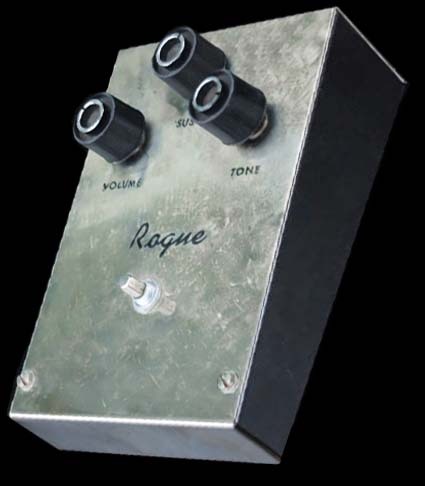 The enclosure is identical to the rare Rogue Fuzz, from around 1973, so this appears to have been made by the same factory. It is possibly the same factory that made the Guild FW-3 and Goya Fury Box. Pot dates I have seen on the TDB are from 1975 and '76. Thanks to DiscoFreq for help identifying the enclosure. 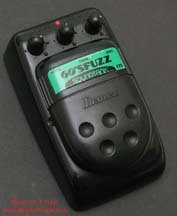 See the fuzz pedal timeline here for more information about other fuzz releases from this era. 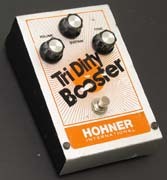 Shown above - The Hohner Tri Dirty Booster. 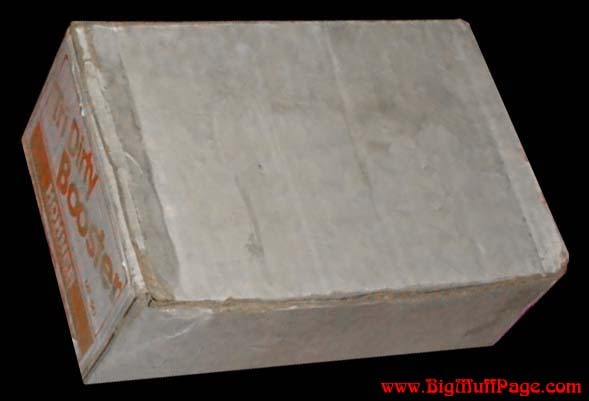 An early clone of the V1 "triangle" Big Muff. This one has a replacement footswitch. 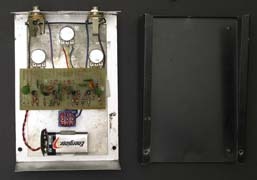 Shown above - The Rogue Fuzz, an early 1970's USA made fuzz pedal. 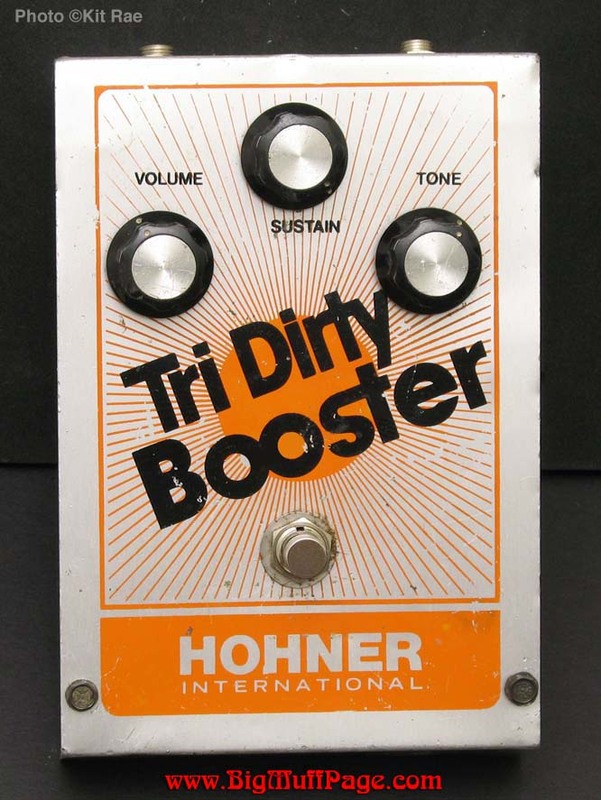 The Hohner Tri Dirty Booster was made in an identical enclosure to this, with the same label on the back side, indicating the Hohner was made in the same factory. 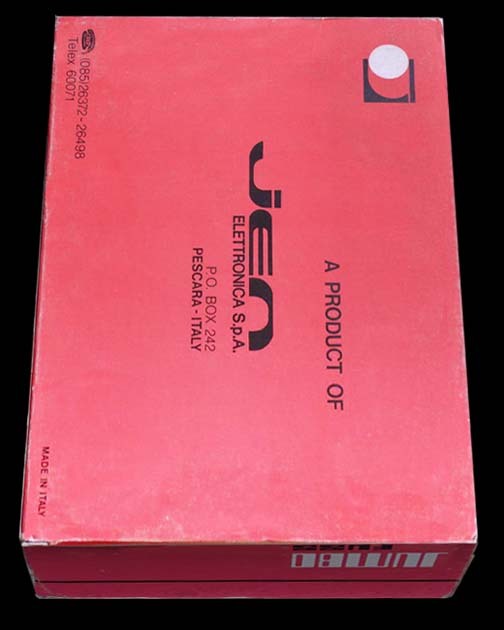 In the early 1970's Jen Elettronica, a large musical equipment manufacturer in Italy, got into the Big Muff clone market with the Jen Jumbo Fuzz. 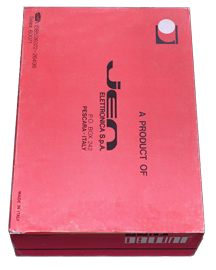 Jen was one of the largest OEM (original equipment manufacturer) musical electronics manufacturers in the Europe at the time. 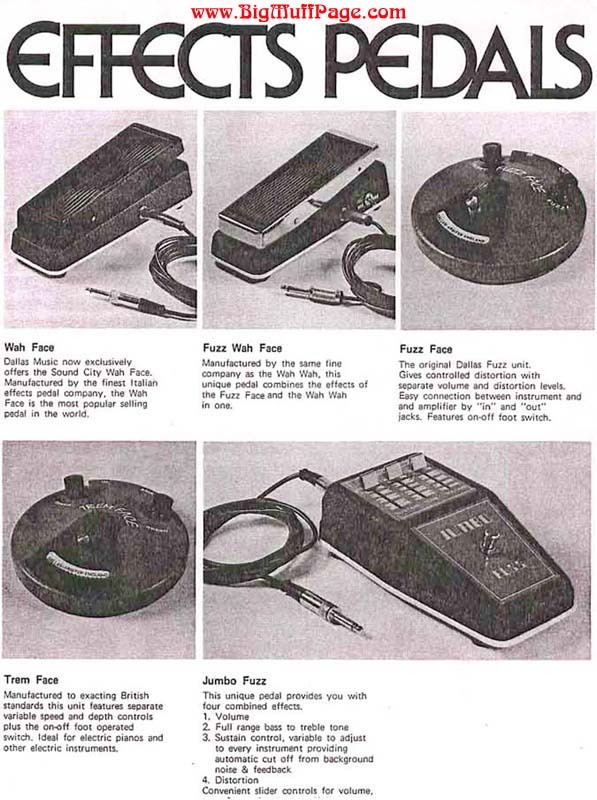 Around 1967 they got into the electronic effects pedal business, making pedals for Vox, Dallas Arbiter, Sound City, Elka, and JHS (John Hornby Skewes), among other brands. Two of the most famous pedals Jen made were the Vox version of the ToneBender in 1967, and the Vox Cry Baby Wah Wah pedal in 1968. 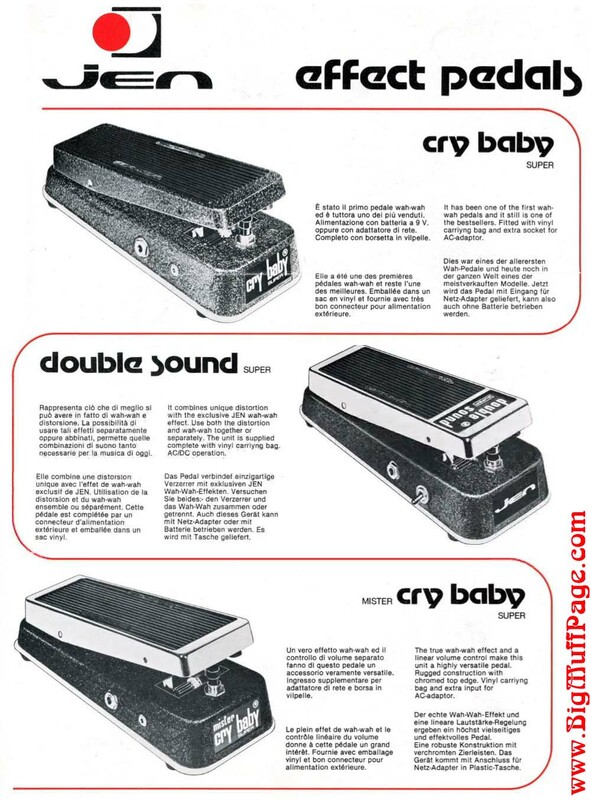 The creation of Jen ties back to the original Cry Baby Wah Wah pedal origins. The Thomas Organ Company, a US manufacturer, secured rights from Vox in England to handle all Vox distribution and manufacturing for the USA market. American made Vox amplifiers were to be less expensive solid state designs, rather than expensive tube amps like their European counterparts. Brad Plunkett at Thomas Organ was tasked with making a cheaper version of the MRB (mid range boost) switch found on the European Vox amps. 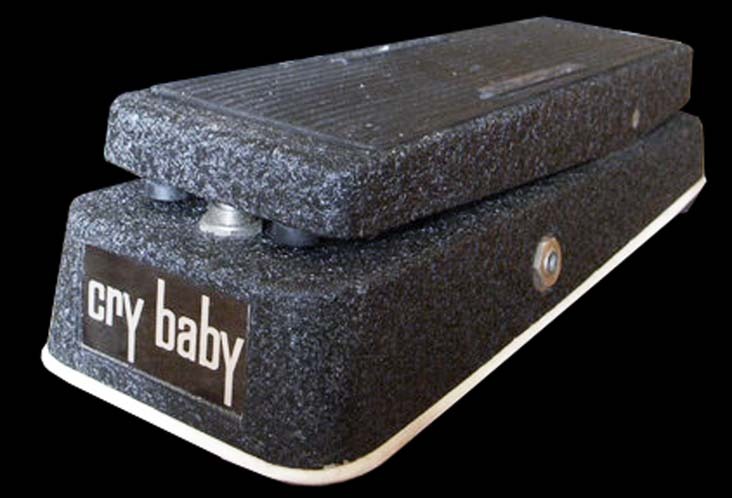 The Wah pedal circuit was the result, which Thomas Organ decided to market as a stand alone pedal in 1967. 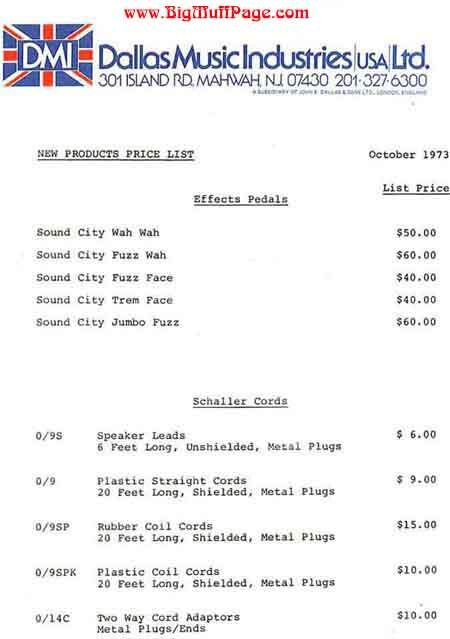 Shown above (left to right) - The Jen die cast pedal collection, 1973 Sound City price list and catalog page showing the Dallas Arbiter version of the Jumbo Fuzz, and the Jen made Cry Baby wah pedal from 1973, using the same white rubber skirt edging as the Jumbo Fuzz case. 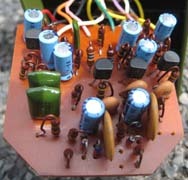 You would not know it from the looks, but inside Jumbo Fuzz was a modified Big Muff Pi circuit. 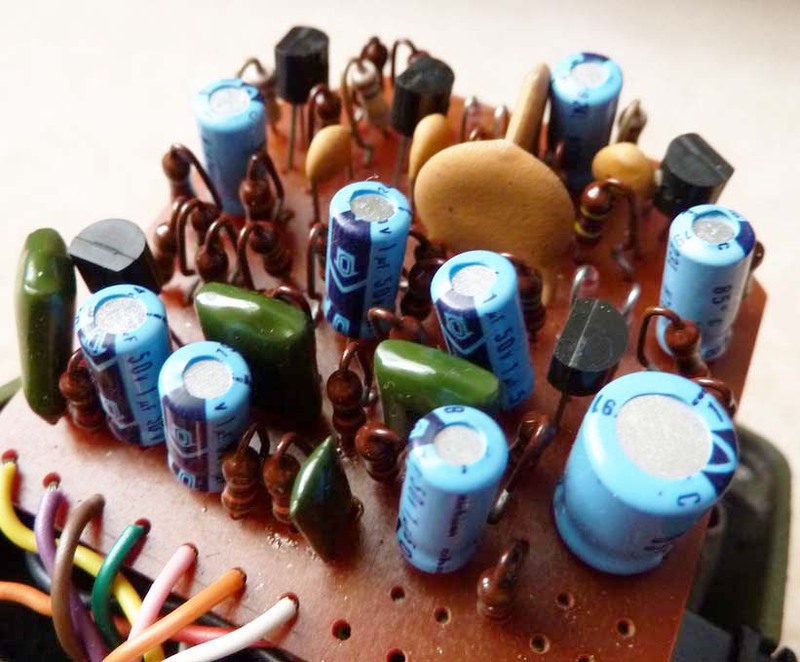 Component values seem to be based on a few V1 Triangle Big Muff circuits, with the 470pF caps from the 1973 V2's thrown in for good measure. 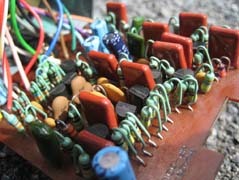 The really unique modification to this version of the circuit was the addition of a Germanium noise gate section to help tame this noisy circuit. 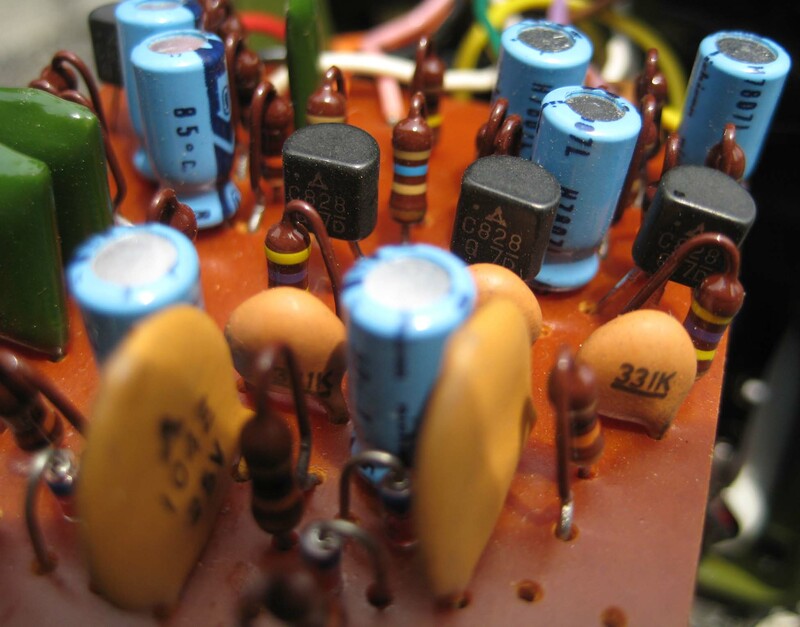 It also had the effect of giving the muff some sputtery gated fuzz effects at the right setings. 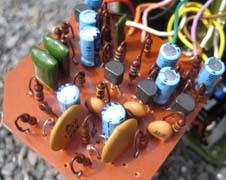 The gate includes two Germanium transistors and two Germanium diodes. 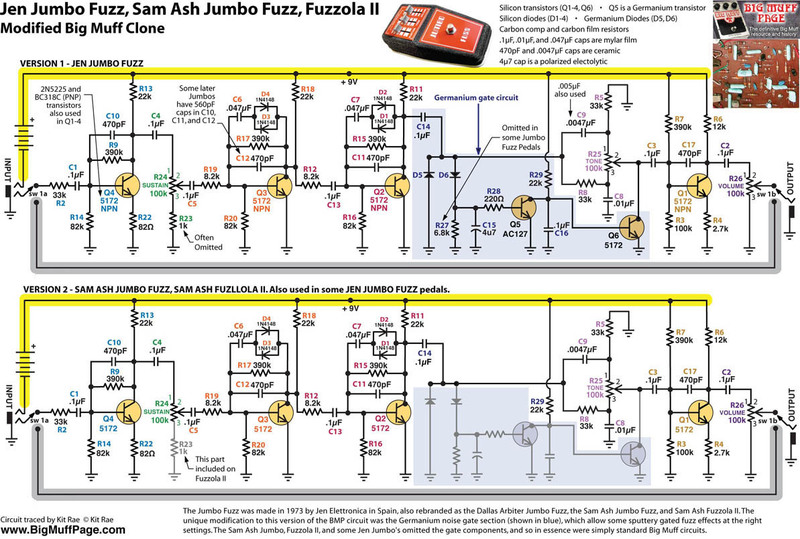 The Sam Ash Jumbo Fuzz, Fuzzola II, and some Jen Jumbo's did not include the gate section components. Oddly, there is a 22k resistor in the gate section that was left in for the versions without the gate. From what I can see, it does absolutely nothing. There is also a 6.8k resistor in the gate that was omitted from many of the Jumbos, as well as extra holes for a 1k resistor going from the sustain pot to ground, just like in a standard Big Muff. 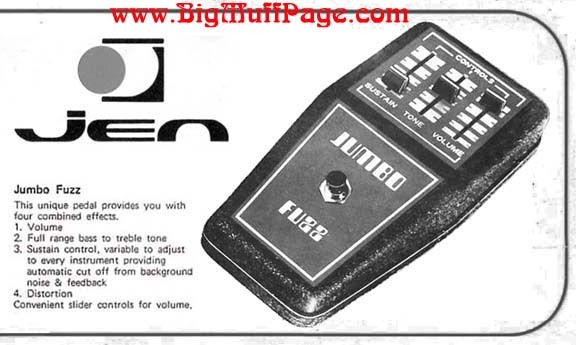 Apparently it was only used on the Fuzzola II version. 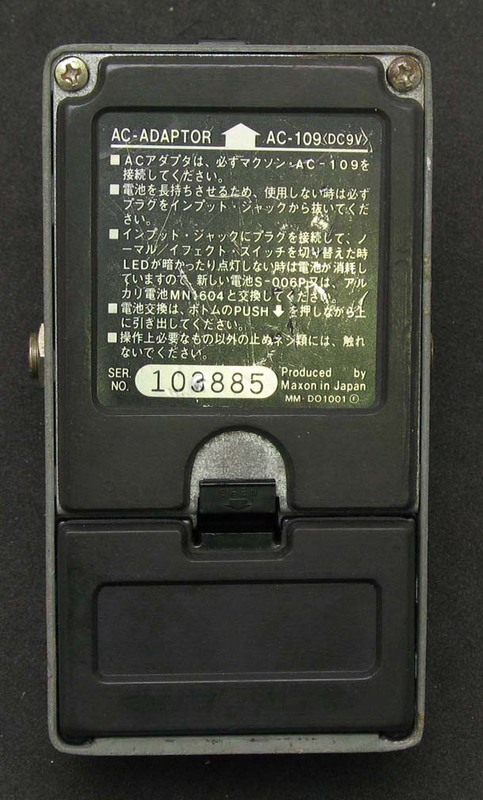 Based on the Jen case style used, the numerical codes on the back, the techno font used (popular from 1972 into the 1980's), packaging style, and other OEM versions dated the same way, I estimate this pedal was made circa 1973-75. 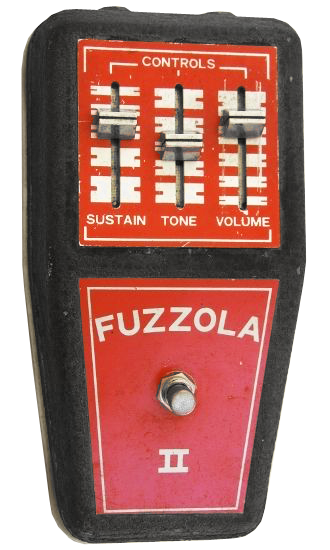 The Dallas Arbiter Jumbo Fuzz version first appeared in a 1973 Sound City (then owned by Dallas Arbiter) price list and catalog, which is the earliest appearance I have found for this pedal. 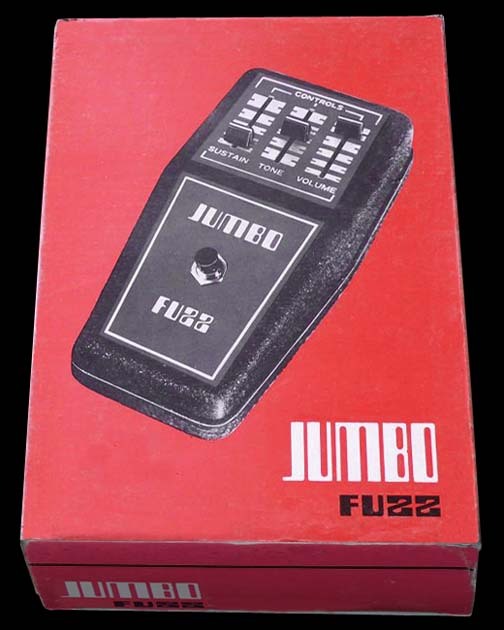 See the fuzz pedal timeline here for more information about other fuzz releases from this era. 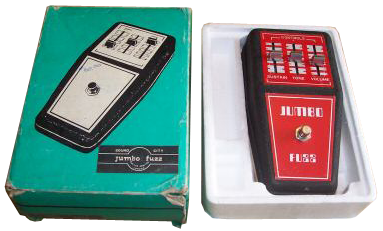 Shown above - Dallas Arbiter Jumbo Fuzz and packaging, circa 1973. Note that the packaging is rather generic, with no labels on the product photo. 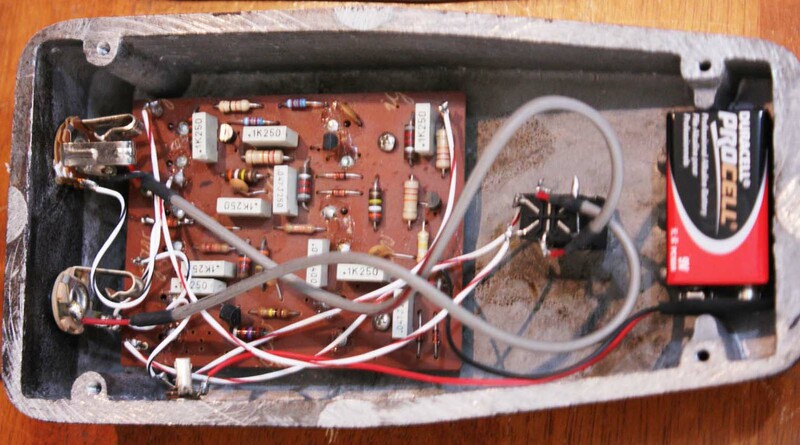 Shown above - Circa 1974 Jen Jumbo Fuzz, packaging, circuit, and my circuit traces. Shown above - Jen Jumbo Fuzz, Sam Ash Fuzzola II, and the back covers of the Jen Jumbo Fuzz, Dallas Arbiter Jumbo Fuzz, and the Sam Ash Jumbo Fuzz. The front graphics for the Jen and Dallas Arbiter versions were identical. visit DiscoFreq's Effects Database, the largest effects database on the web. In 1962 Joe and Larry Macari founded the Sola (pronounced Solar) Sounds Ltd company in London, UK. 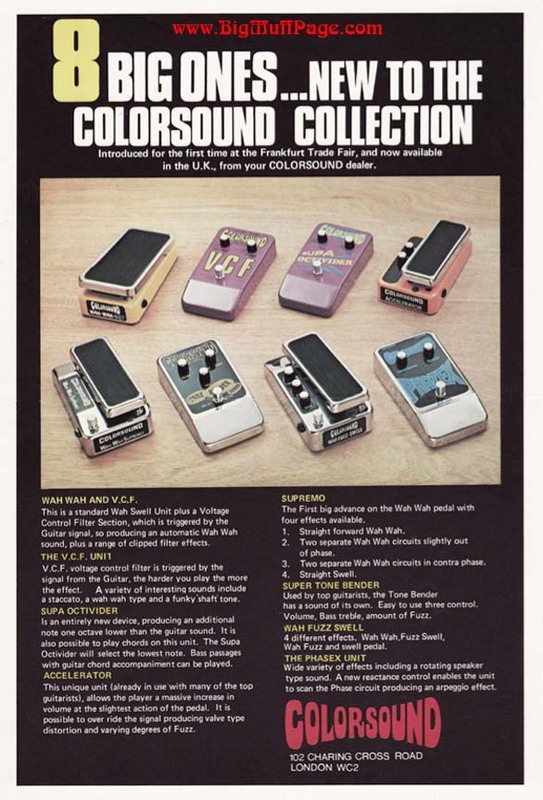 They created a line of very popular effects pedals under the brand name Sola Sound, and later under the brand Colorsound. 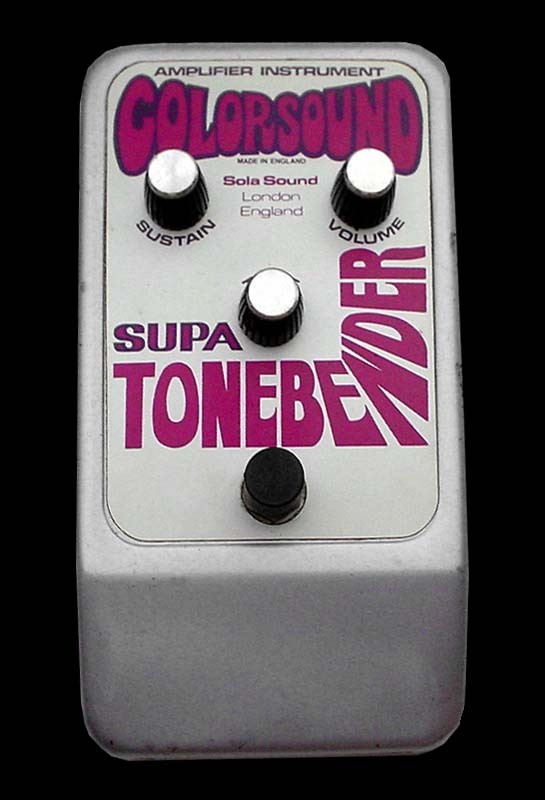 The most popular pedal in the Sola Sound line was undoubtedly their legendary Tone-bender. Its designer has also become a legend. 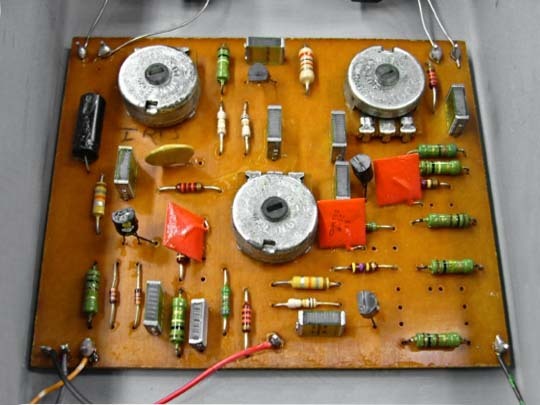 Gary Stewart Hurst, designer for Macaris Music Exchange in London, created the first MK I Tone-bender by modifying the Gibson made Maestro Fuzz-Tone (FZ-1) circuit in 1965. Gary followed that with the much improved Tone Bender Professional Mk II. 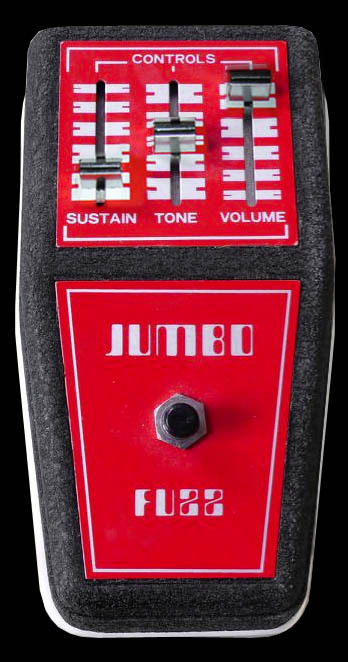 Many different versions of these 2 knob Tone Bender fuzz pedals were created for the Sola Sound brand in the years that would follow, including numerous OEM version for Vox, Marshall, and others. Gary had little or no involvement with many of the later incarnations. Throughout the later years the Tone Bender would go through many circuit, graphics and enclosure changes. 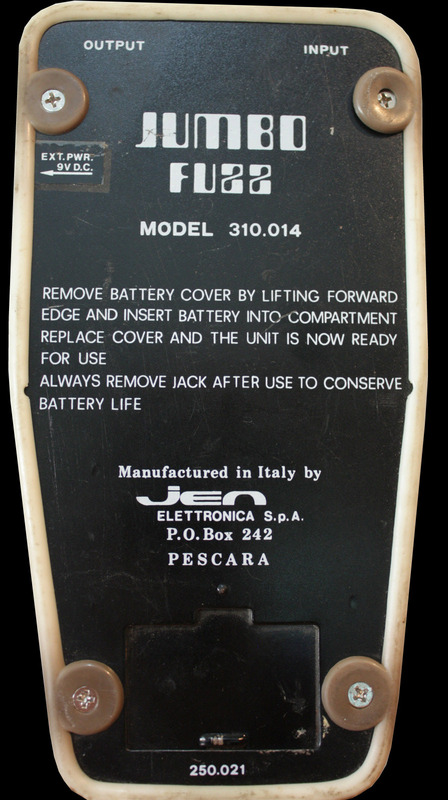 Sola brought a three knob Mark III Tone Bender version to the market around 1969, and a mark IV version in a new enclosure around 1970, labeled the Tone Bender Fuzz. 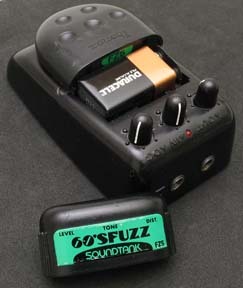 See the fuzz pedal timeline here for more information about the various Tone Bender versions from this era. 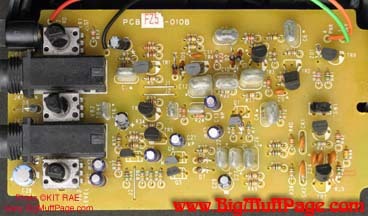 By 1973 the USA made Big Muff Pi had become known around the world and in the UK. Sola Sounds decided they wanted to use the circuit for their Tone Bender line, but rather than knock it off exactly, Sola made a few changes, creating a unique sound. 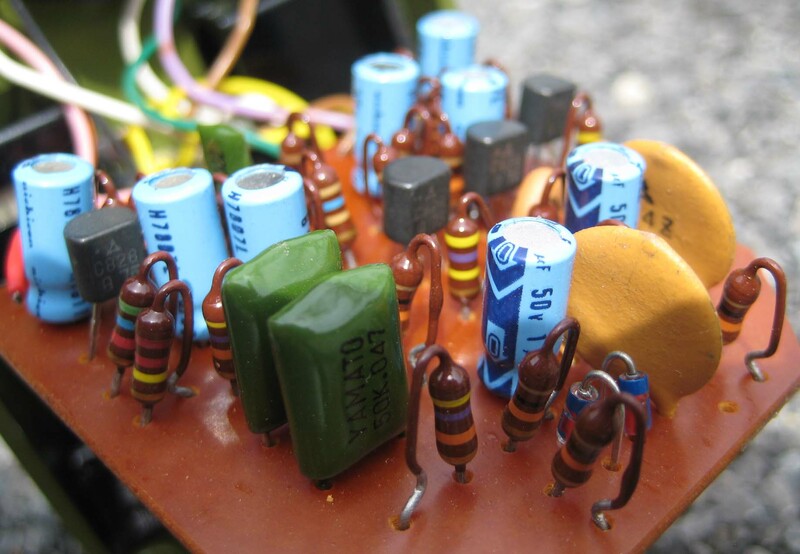 I have also seen photos of a three-transistor Supa Tonebender, which appears to be the pcb from the later Jumbo Tonebender, so Sola may have made some Supas with those circuits as well, or there was some cross over when the version changed. 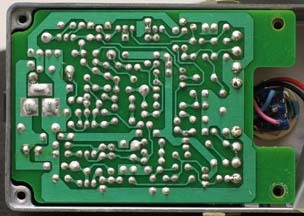 The Supa circuit board was made in two slightly different layouts, although the circuits were identical. The pedal had a bright orange enclosure, similar to some other Colorsound pedals from this period, like the Overdriver, then changed to a silver enclosure. 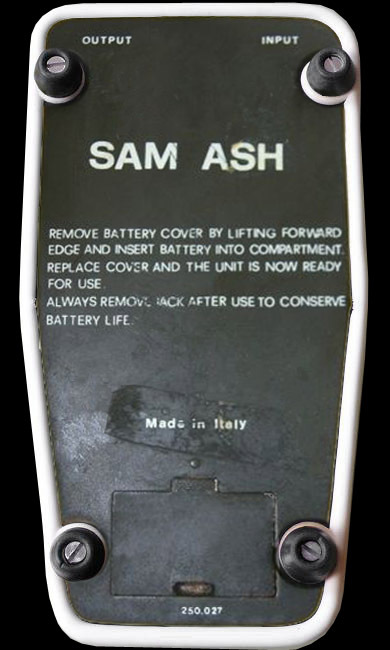 Around 1977 the enclosure became chrome plated, with graphics changed from a silk screen to a printed, adhesive backed label. One prominent Supa user was guitarist Steve Hackett of Genesis. THE COLORSOUND JUMBO TONE BENDER - Around 1975 or '76 Sola Sound made a three transistor circuit in the same jumbo sized enclosure as the Supa Tonebender, but marketed as the Colorsound Tone Bender Jumbo. 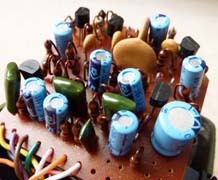 This three transistor-version was also based on the Big Muff circuit, specifically from from a V3 era Big Muff, although in an even more stripped down form. 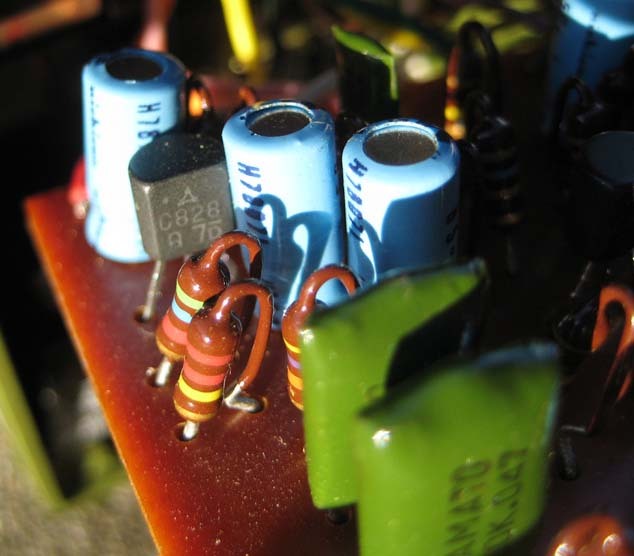 Two clipping diodes were removed in the first gain stage as on the four transistor Supa version, but Sola chose to simply eliminate the last gain recovery stage of the circuit for this version. This made it more open sounding and not as compressed as the traditional Big Muff. 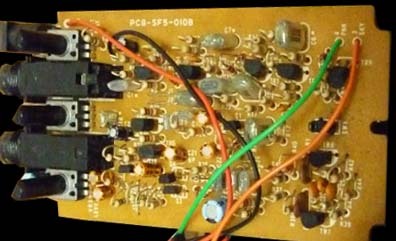 The purpose of the last stage in the original design was to recover some of the audio gain lost (approximately 8db) in the tone section, so removing it made for a very weak, low gain Muff. It almost sounds like some of the clean signal is mixed in with the distortion. This made for a muff that was rather lifeless for electric guitar leads and chords, but worked very well for bass guitar. 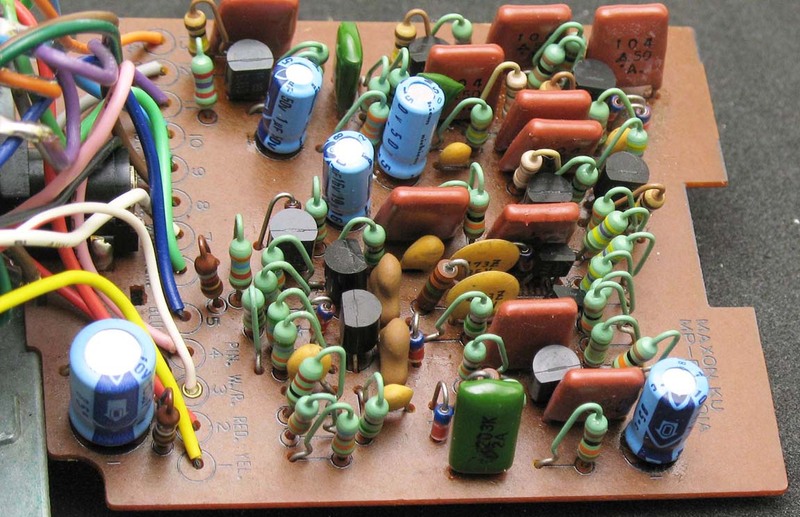 The Jumbo Tonebender circuit board was made in two slightly different layouts, although the circuits were identical. Early version Jumbos were in a silver enclosure, with two different ink color variants. Around 1977 the enclosure became chrome plated, with graphics changed from a silk screen to a printed, adhesive backed label. There were two versions of the label. The enclosure color changed to silver again around 1979, then black. 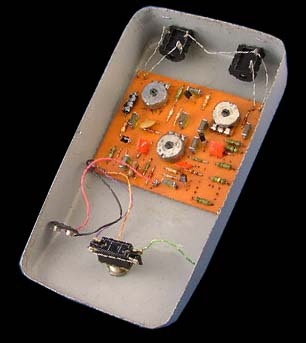 THE TONE BENDER FUZZ "TONE" CONTROL VERSION - The older, narrow silver boxed version of the three knob Germanium based Tone-Bender Fuzz Mk IV from 1969-70 continued to be sold throughout the 1970's. 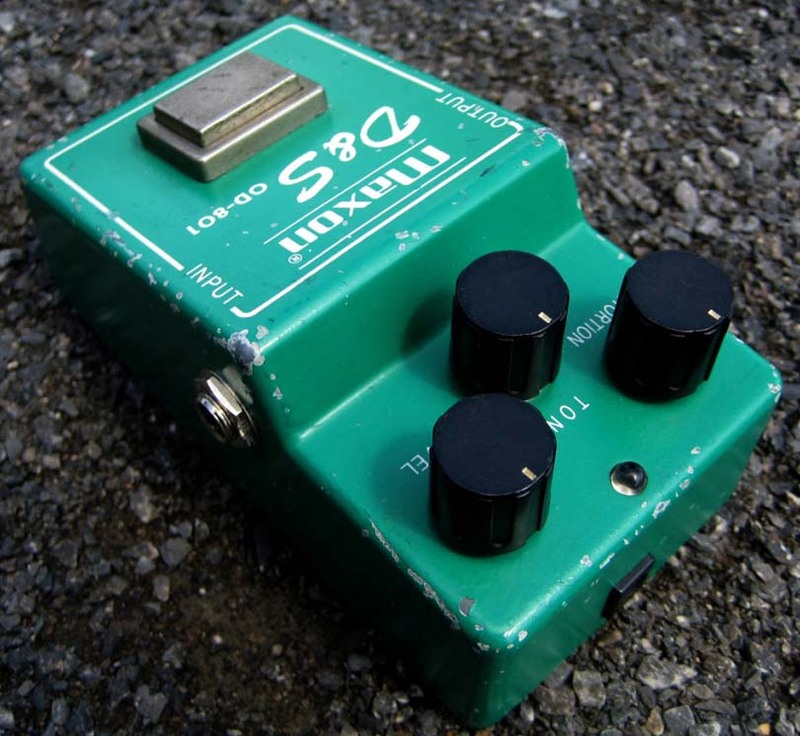 Around 1976-77 Sola started using the modified Big Muff circuit from the Jumbo Tonebender in these pedals. 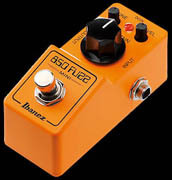 Previous Tone-bender Fuzz pedals had the words TREBLE and BASS under the tone knob, but since the circuit now used the trademark scooped mids Big Muff tone control, the word TONE now appeared under the knob. 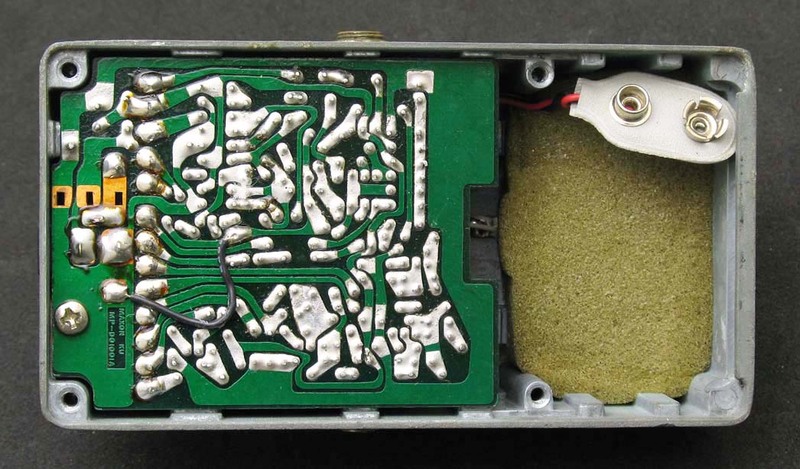 Otherwise the silver enclosure appeared identical to the previous Germanium based Tone Bender. 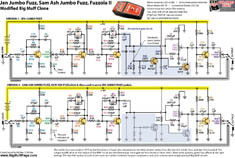 The Jumbo Tonebender circuit board was made in two slightly different layouts, but the examples of the Tone-bender Fuzz that I have seen only used the first version. 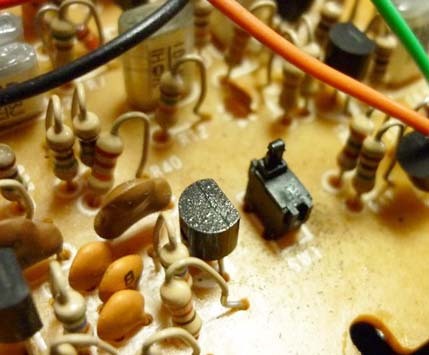 There was a reissue of the 1970's narrow box Tone Bender Fuzz on the market in the 1990's that featured the same three transistor Jumbo Tone Bender circuit, but in a different layout. THE TONE BENDER FUZZ REISSUE - In the 1990's Macaris of London reissued the 1970's narrow boxed, silver Tone Bender Fuzz, but for some reason it was not made with one of the Germanium transistor circuits of the classic Tone-Bender MkIII/IV, but rather used a new layout of the three-transistor Jumbo Tone Bender circuit. 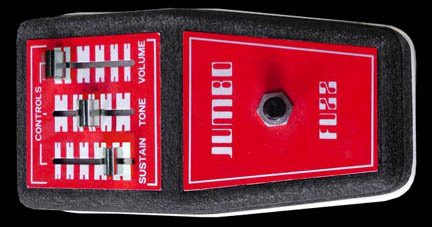 The Tone-Bender Fuzz was actually made with a version of this same Jumbo circuit around 1976-77, the Tone Control version mentioned above, but this '90's reissue did not have the word TONE under the tone knob as the Jumbo circuit version had, but rather used the original TREBLE and BASS labeling like the classic Tone-Bender version. Confused yet? 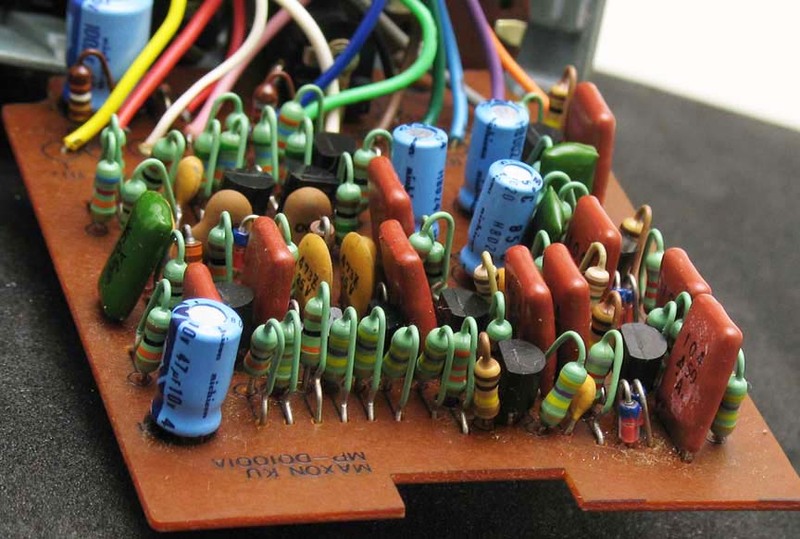 I have also seen one Jumbo Tone-Bender with the four-transistor Supa circuit, so occasionally these swapped versions may have been made. 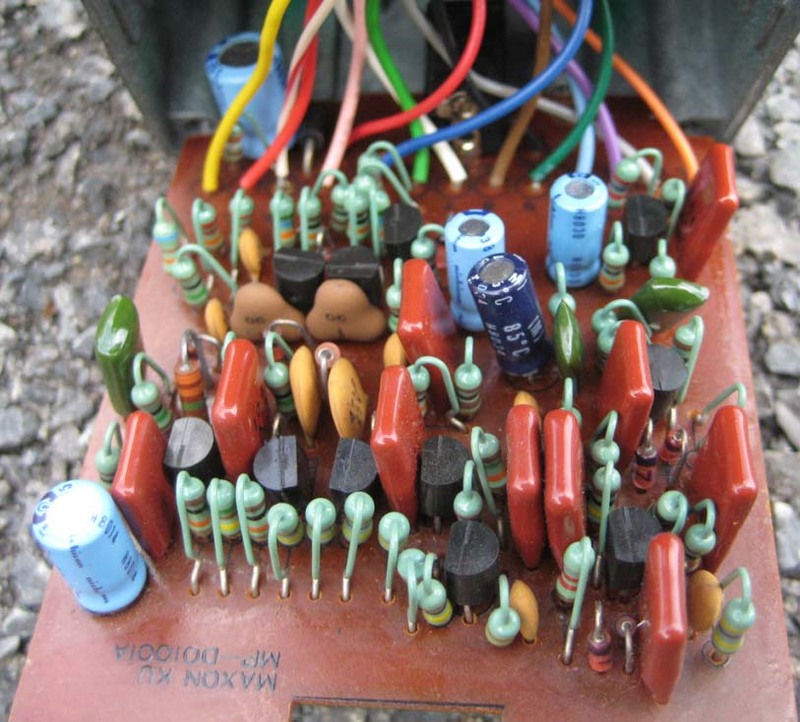 Both the Supa and Jumbo were produced simultaneously throughout the mid to late 1970's with a wide variety of graphic designs, color schemes, and slight variations in circuit component values. All were made in the wide Tone Bender style enclosure, with early Supas having the footswitch at the bottom end, and later Supas and all Jumbos having the footswitch mounted slightly higher on the flat top surface. 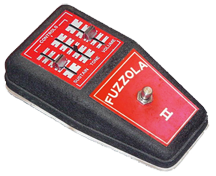 See the fuzz pedal timeline here for more information about other fuzz releases from this era. 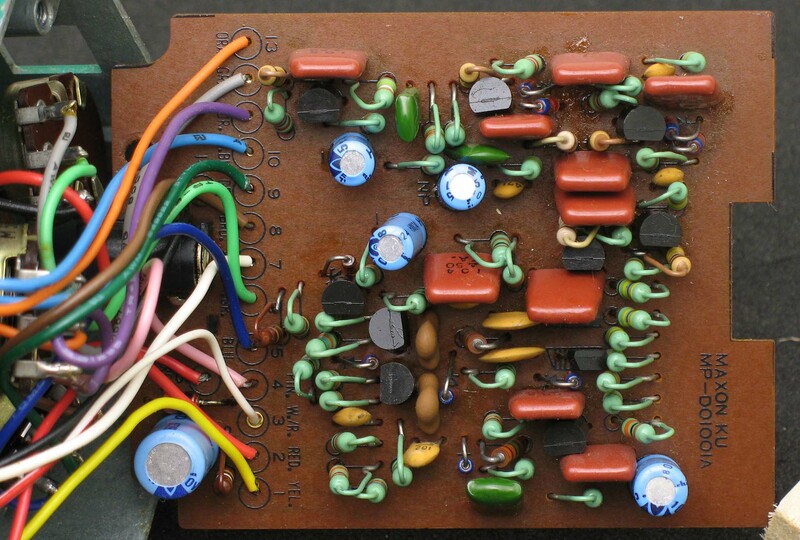 Shown above - A Colorsound Supa Tonebender, made by Sola Sound circa 1973, with a very familiar Silicon transistor circuit design. 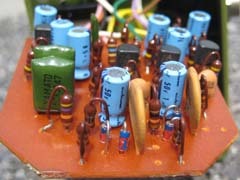 Essentially a Big Muff circuit with the first set of clipping diodes removed. Around 1974 two versions of another four-transistor pedal inspired by The Big Muff circuit appeared on the market. The Maxon D&S (Distortion & Sustainer) OD-801 , and the Ibanez Overdrive OD-850. The pedals have a somewhat more refined Big Muff sound than other clones of the circuit, due to a modified tone circuit. Both were produced by the Nisshin Onpa company in Matsumota, Japan. 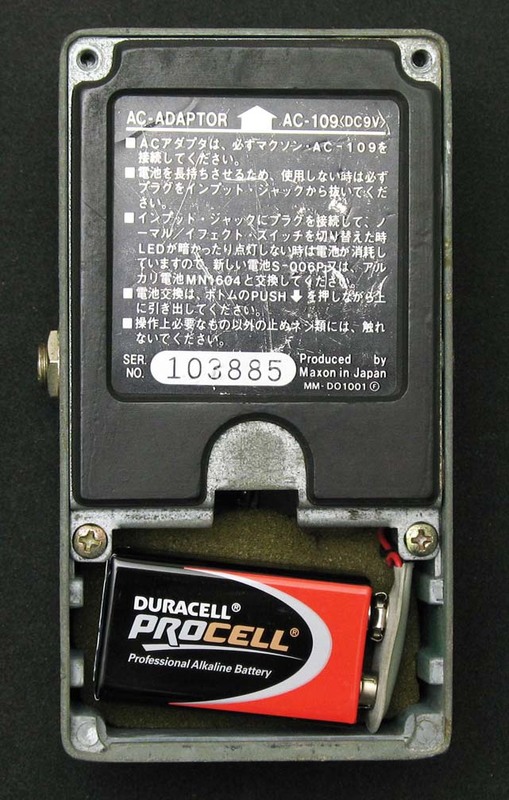 Nisshin Onpa was primarily a domestic Japanese manufacturer of audio electronics and guitar pickups. 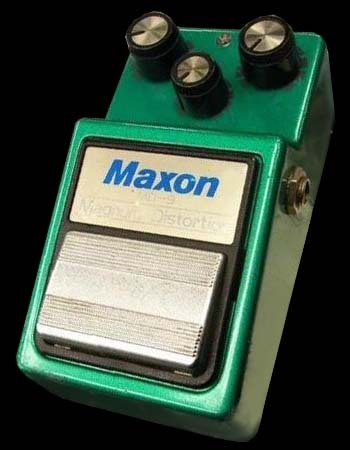 In 1969 they began designing and producing guitar effect pedals under their Maxon brand, but they soon became an OEM (original equipment manufacturer) pedal manufacturer for other companies as well. In the early 1970s the Hoshino Trading Company began having clones made in Japanese factories of Gibson and Fender guitars, distributed worldwide under their Ibanez brand. 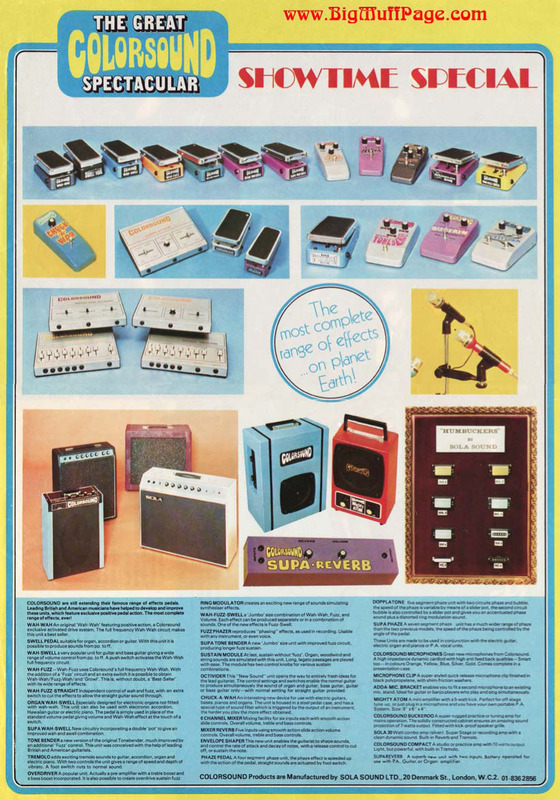 Around 1970 they decided to get into the booming effect pedal business, buying and distributing OEM versions of pedals from various manufacturers. They approached Nisshin Onpa to license the Maxon designs for worlwide distribution under their Ibanez brand name. 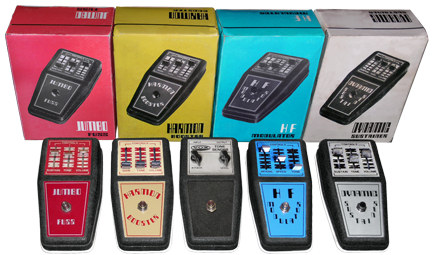 Most of these Ibanez branded pedals were nothing more than OEM versions of the original Maxon pedals, simply rehoused in different Ibanez branded enclosures. Looking inside each, you will find the exact same Maxon circuits. 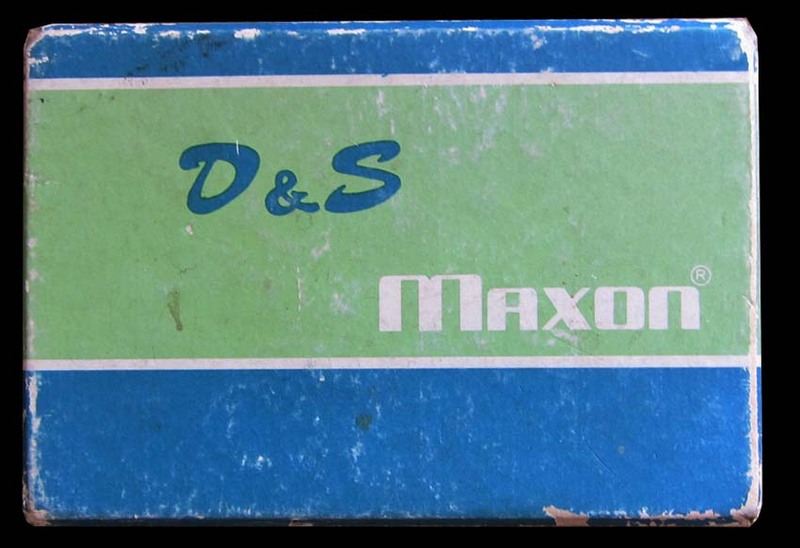 As Maxon designed and developed new pedals throughout the 70s, they would license and manufacture the same pedals for Ibanez. This relationship lasted until 2002. Many people may be surprised to know that Ibanez had nothing to do with designing or making pedals, and was nothing more than a brand name owned by a trading company, slapped on another companies products. Without a doubt, Ibanez became the more well known name. Factories licensing their products to other companies to be rebranded was not uncommon at the time, and is still very common today. OEM business helps keep costs down by keeping volume high. 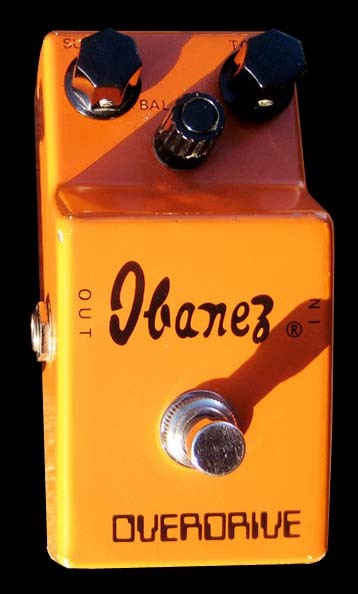 Ibanez pedals became famous when well known musicians were spotted using them. Carlos Santana, Gary Moore, and Stevie Ray Vaughan were among the scores of celebrated users. These early 1970s Ibanez pedals went on to become highly collectible worldwide, fetching top prices on the vintage pedal market. 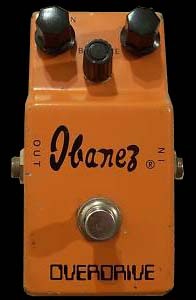 The Ibanez TS-808 and TS-9 Tube Screamers are probably the most well known and collected Ibanez pedals, but the cherished orange OD-850 Ibanez Overdrive often fetches comparable or higher prices. 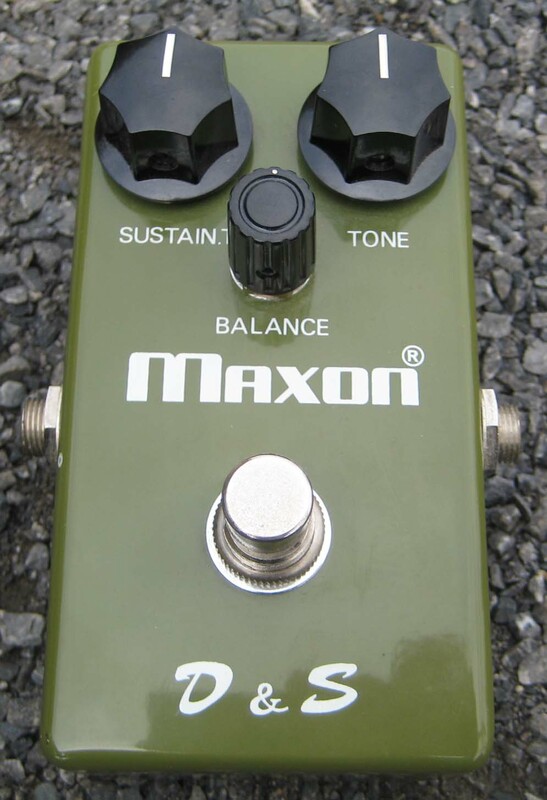 Being mostly a domestic Japanese brand, the Maxon versions are not as well known, but can be found for much more reasonable prices. Other than the enclosures, the original OD-850 is exactly the same circuit as the Maxon OD-801 counterpart. 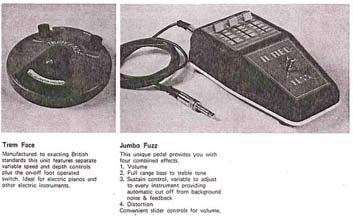 These pedals were also repackaged numerous times under other pedal names for both brands. 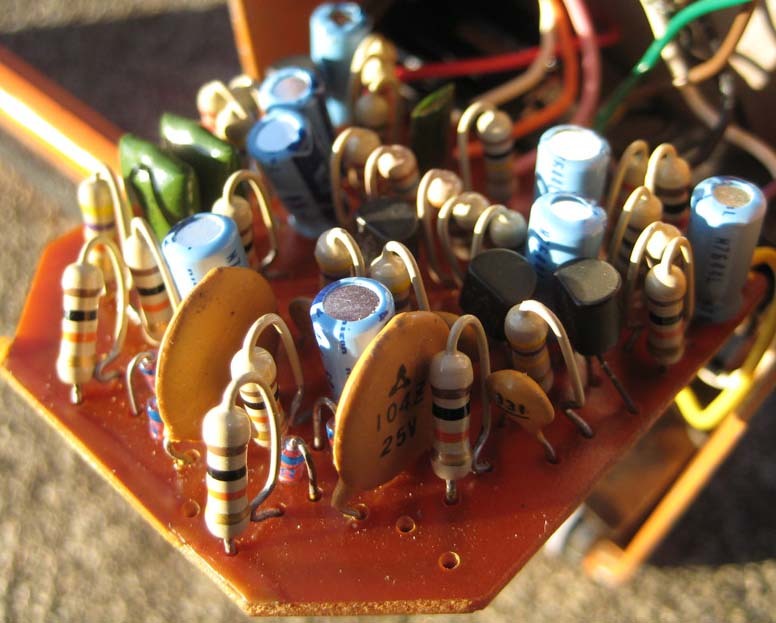 The gain and tone section circuits were essentially the same in all, with only minor modifications throughout the various versions. 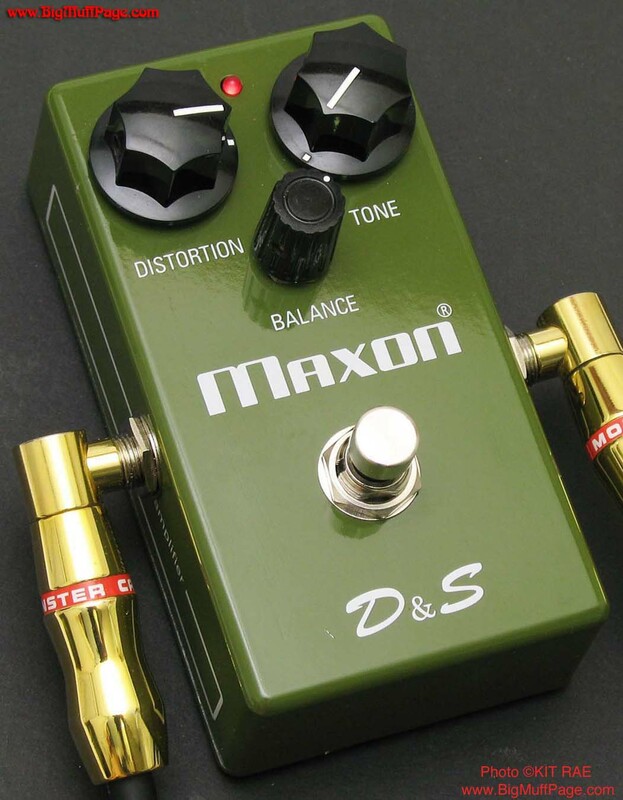 Maxon also made a D&S II and the Ibanez Overdrive II, but these are different circuits, using op-amp ICs and Germanium diodes, and bear no relation to the Big Muff. 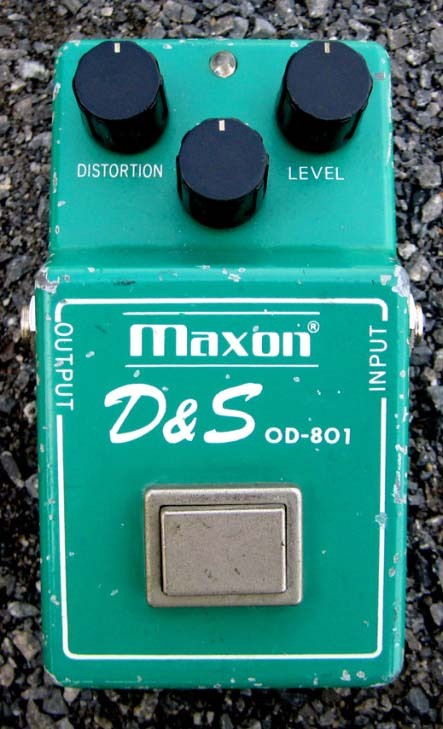 The Maxon D&S was made in at least four versions. 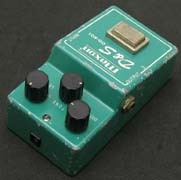 The first edition, circa 1974, shows the word "SUSTAIN T" in the graphic, with a circuit crammed into a small MXR sized enclosure. Power from 9v battery only. 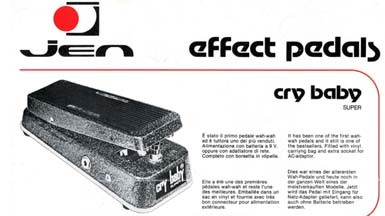 A second edition, circa 1977, included an LED and SUSTAIN T was changed to DISTORTION. It also had graphics and knob changes, a different circuit, and added a DC power jack. 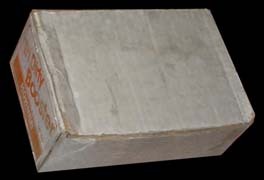 The third edition, circa 1979, had several significant changes. The Big Muff style circuit was modified and enlarged to include dual FET electronic bypass switching, buffer, and a momentary foot switch. 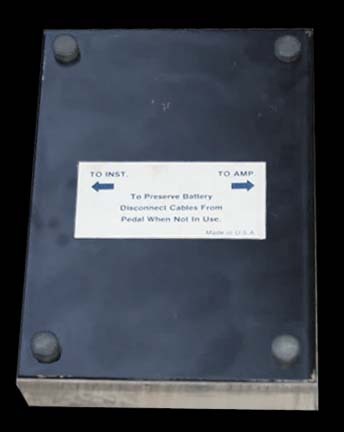 The larger circuit board would not fit in the old enclosure, so the D&S was rehoused in the new, larger style Maxon enclosure with a square button and removable battery door on the back. The knobs remained the same as the second edition. 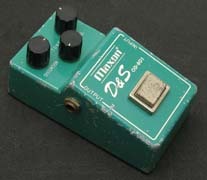 The sound was similar to the earlier D&S pedals, but with more bottom end. Around 2009 Maxon made a fourth edition, for the Maxon reissue series. 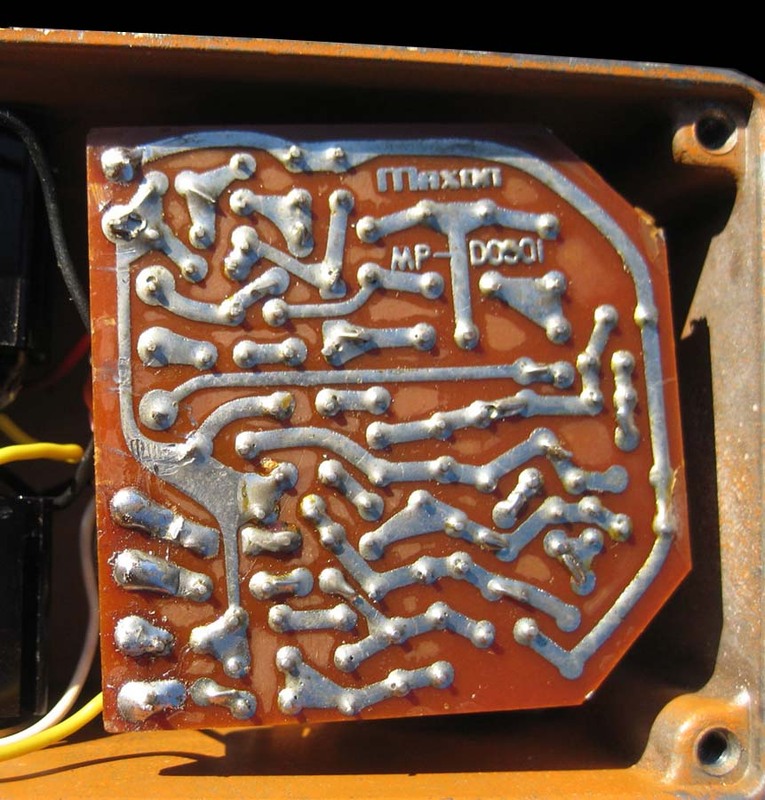 The old MXR sized enclosure returned, though the larger third edition circuit design (with buffer, and FET electronic bypass) was retained, this time crammed onto two stacked circuit boards. 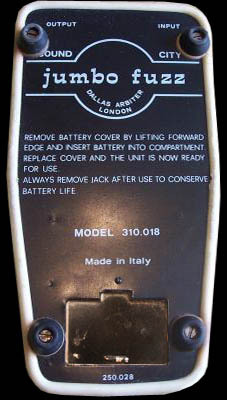 Graphics were a mix of version one and two, including the LED and original knob styles, with DC power jack from the second version. The sound is similar to the early editions, but with less bottom end. Overall the reissue sounds thinner. Note that D&S stood for "Distortion & Sustainer", two trademark words Electro-Harmonix used in advertising to describe the V2 Big Muff in the mid seventies. 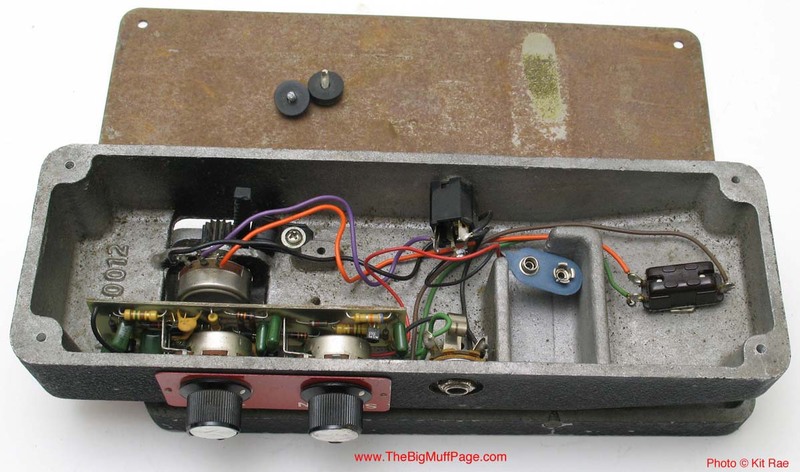 Interestingly E-H made OEM versions of their own V2 Big Muff around the same time in the mid seventies for the Marveltone, Wabash, and Lyle brands, each called the "Distortion Sustainer". 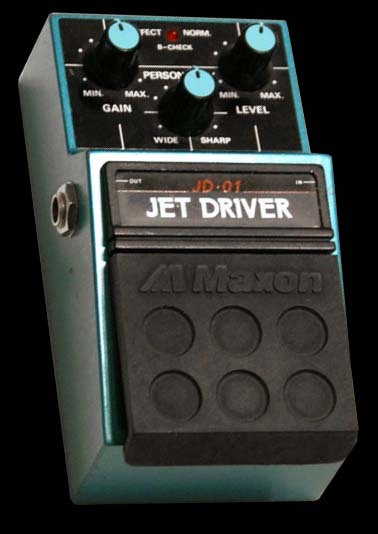 I presume this is where Maxon got the idea for their name, to deliberately associate their pedal with the Big Muff Pi. 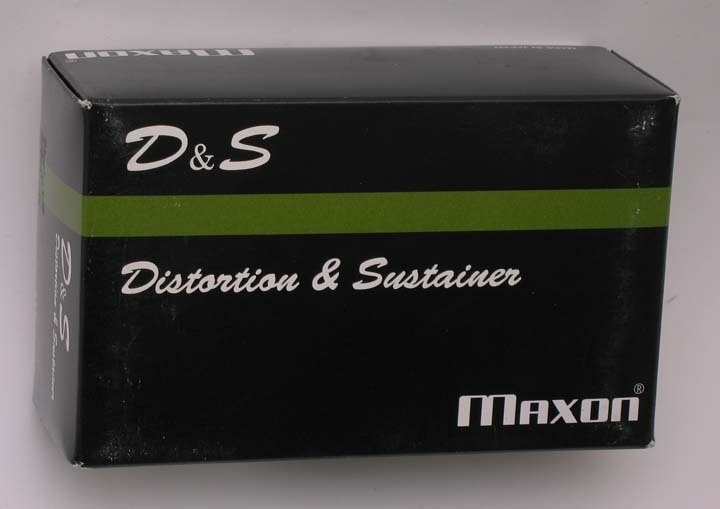 Maxon also rebranded versions of the same D&S circuit in their Magnum Distortion MD-9 and Maxon Jet Driver JD-01 pedals. 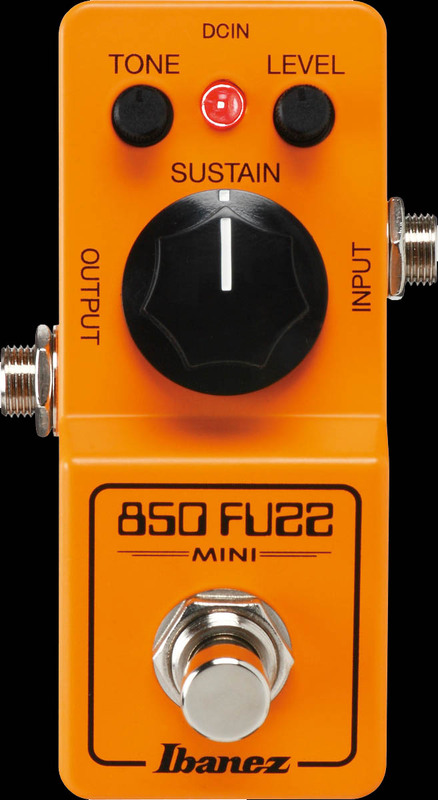 See the fuzz pedal timeline here for more information about other fuzz releases from this era. 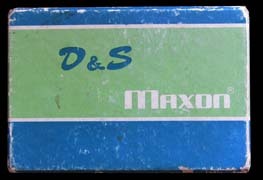 Shown above - The fourth edition Maxon D&S reissue, circa 2009. Sonically, this version sounds less like the third edition and more like the original, though less bottom end and thinner. The circuit appears to be more like the third edition, including the momentary switch, FET electronic bypass, and buffer. Graphics and knobs are a mix of the first and second editons. 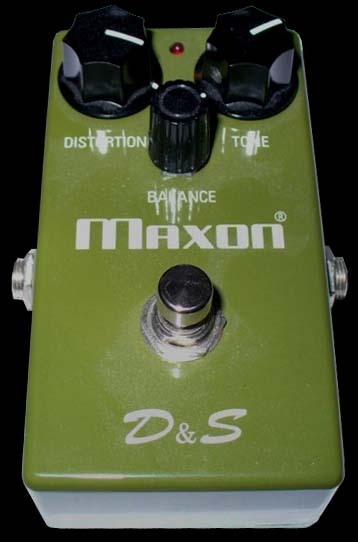 The Ibanez versions of the D&S pedal mirrored the Maxon circuit board changes, but were housed in completely different enclosures so the fact that they were the same pedal was not so obvious. 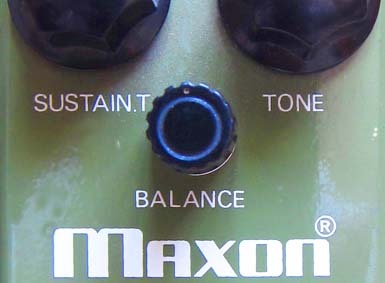 The knobs used were identical to the Maxon versions. 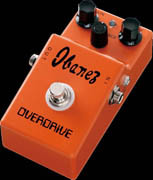 There were three versions of the Ibanez OD-850 Overdrive. 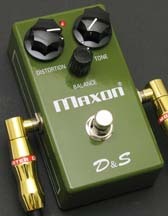 The first was in a skinny enclosure with identical knobs and circuit to the first edition Maxon D&S. 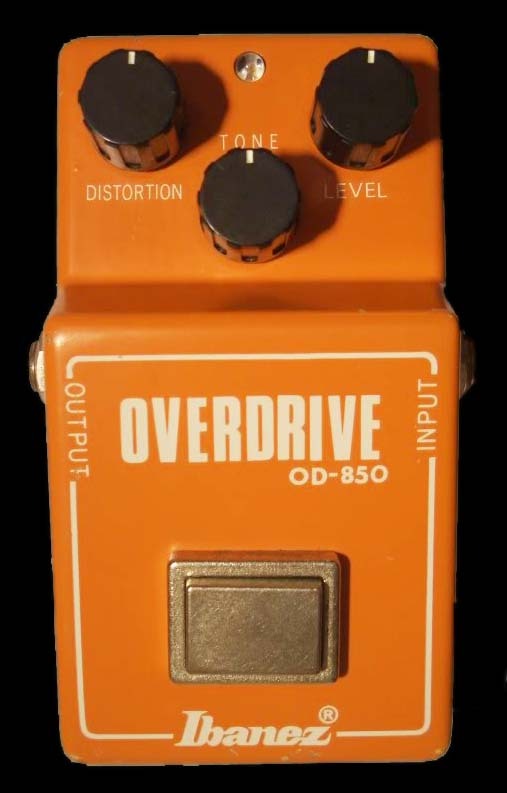 The second edition of the OD-850, known as the "Hummingbird" Overdrive due to the bird graphic on the side, was enclosed in a slightly different case. It was made with the same circuit as the Maxon OD-801 second edition, now including an LED and AC power jack. 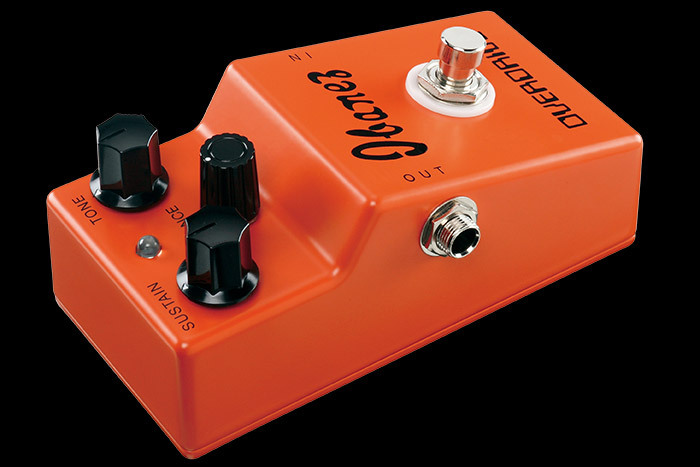 The third edition was rehoused in an identical enclosure to the Maxon OD-801 third edition, with a square switch. 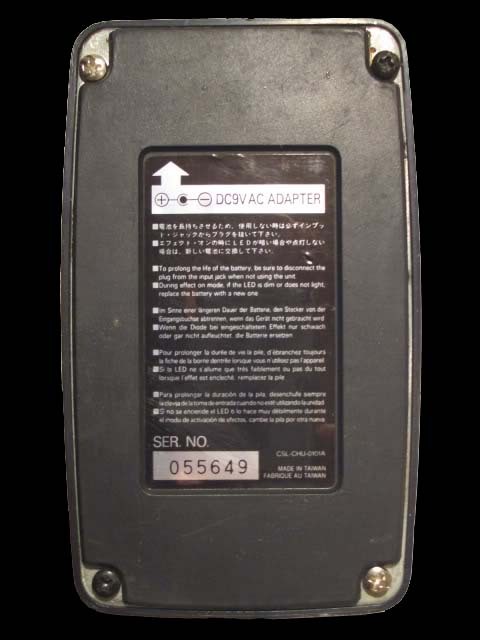 It was made with the same pcb as the OD-801 third edition, including the FET electronic bypass system, buffer, and momentary switch. All three versions are very collectible. 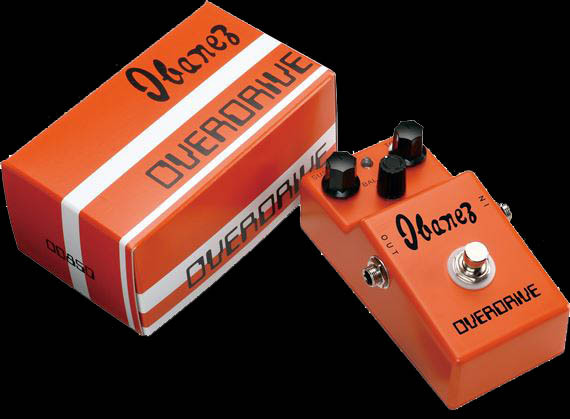 One of the more rare variants of the Maxon D&S/Ibanez Overdrive, and most expensive on the collector market, was the Ibanez OD-9 Overdrive. 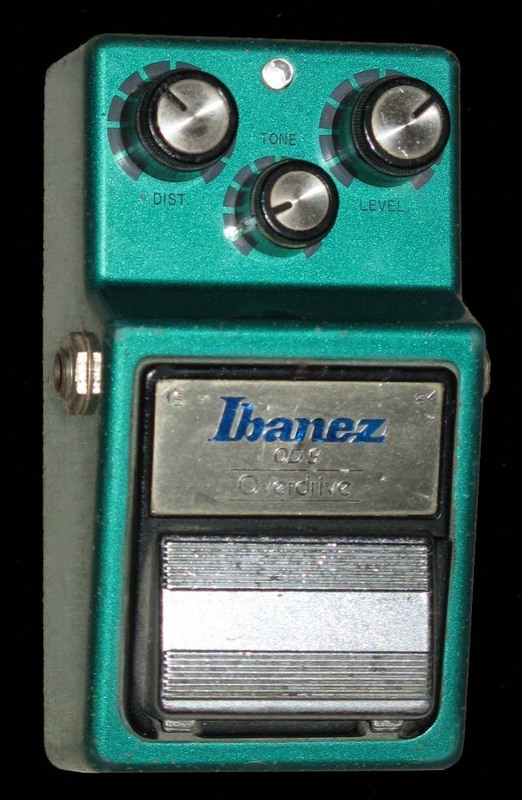 The rumor is that Maxon had made a small run of Ibanez enclosures with this blue/green color they needed to get rid of, so the OD-9 was born. Whether or not that is true, very few of this version were made, making them very collectible. 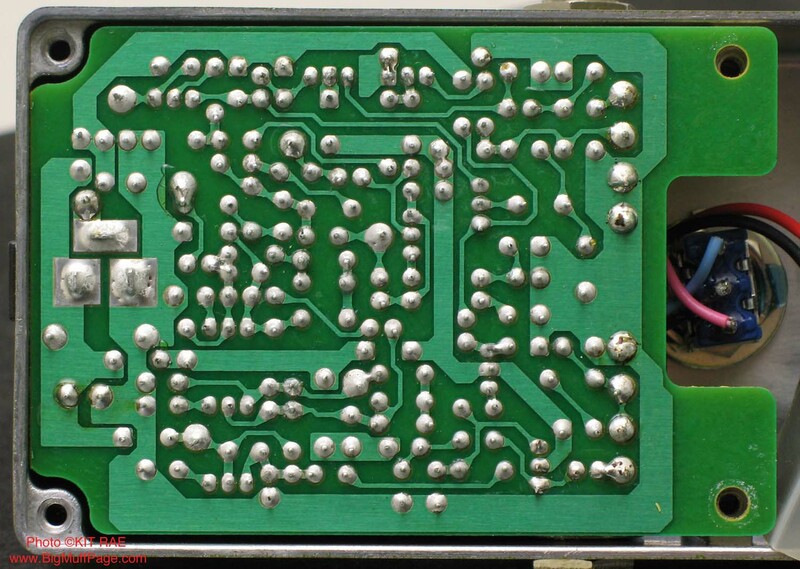 The circuit board and component values are identical to the Ibanez OD-850 and Maxon OD-801 third editions. 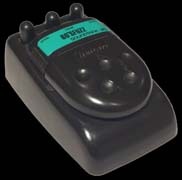 Ibanez stopped using Maxon as a manufacturer in 2002. 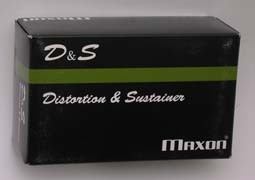 Since that time Maxon has marketed their brand worldwide and reissued many of the older pedals, including the Maxon D&S. 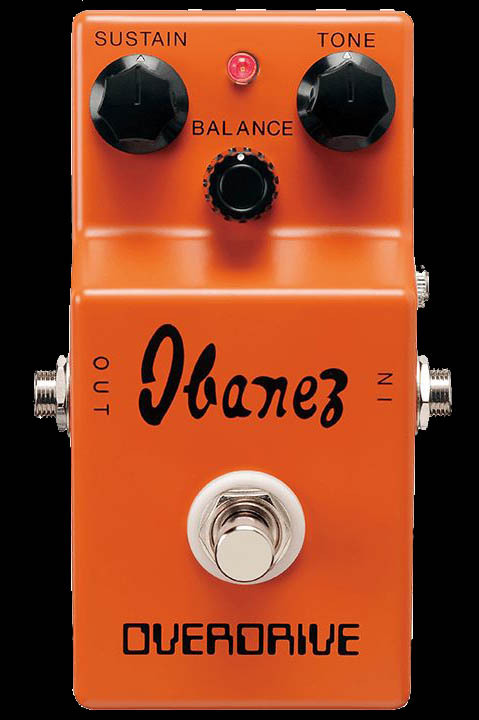 Ibanez has also reissued many of their pedals, manufactured by other factories, including the OD-850. 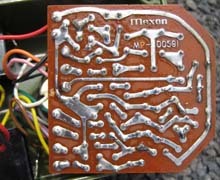 The circuits are different than the original Maxon circuits. 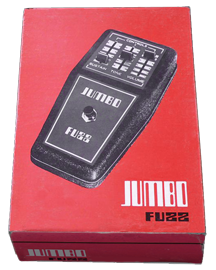 See the fuzz pedal timeline here for more information about other fuzz releases from this era. Shown above - 1977 Ibanez advertisement featuring the Ibanez Overdrive. Click to see the full page ad. 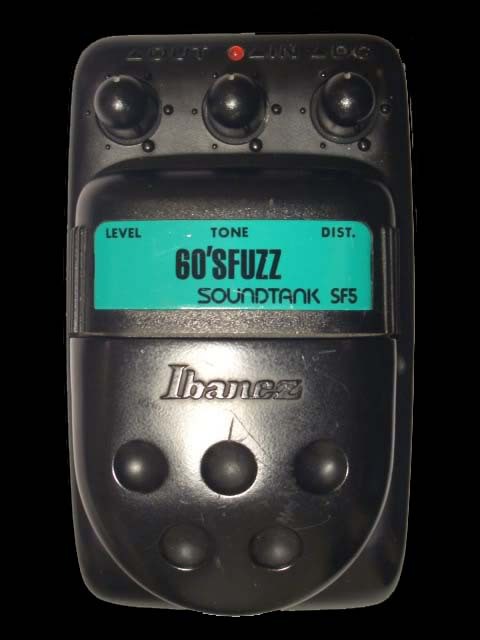 In the early 1990s Ibanez came out with the Taiwan made Soundtank series, also known as the Ibanez 5 series. 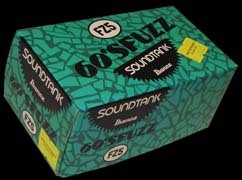 Soundtank was the Ibanez economy line, housed in cheap plastic, beetle shaped enclosures, although the circuits were manufactured of high quality. 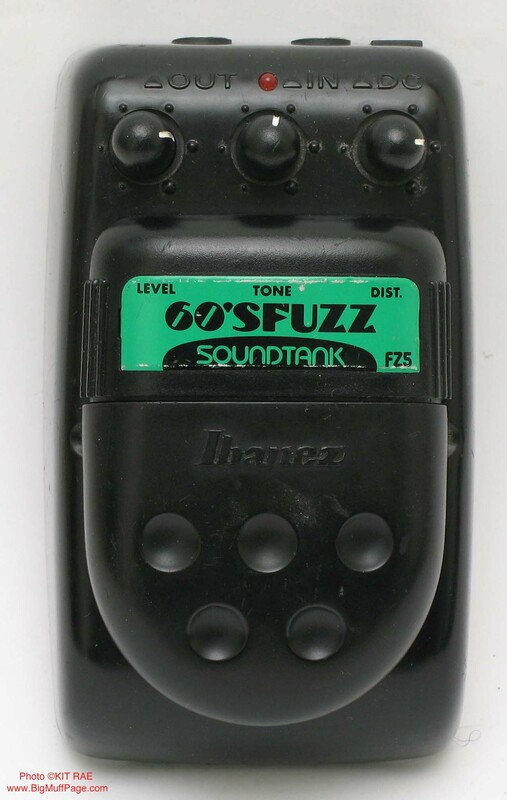 The Ibanez SF5 60'S FUZZ was the "poor mans OD-850". 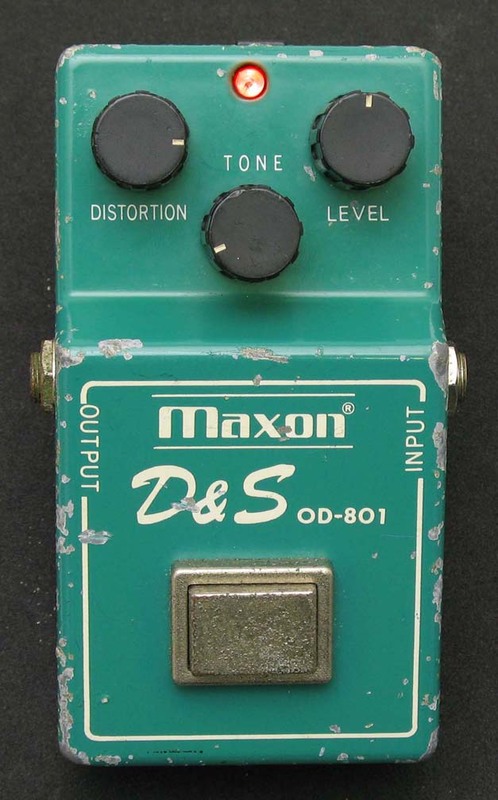 The distortion section of the circuit is similar to the Maxon D&S first edition, and sounds nearly identical. 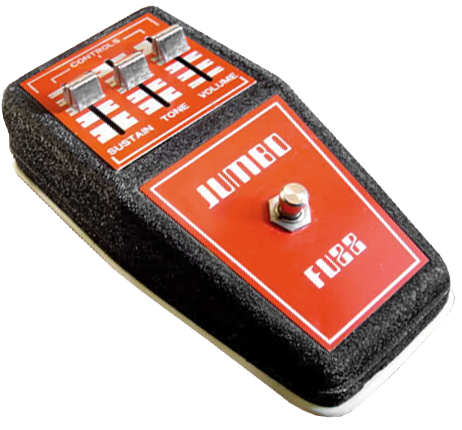 Includes a FETT electronic bypass circuit and buffer and momentary switch, similar to the OD-850 third edition/OD-801 third edition. 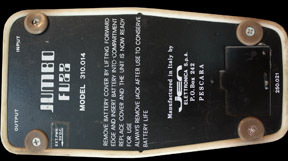 Maxon later changed the item code to FZ5 and changed the logo graphic, although the circuit remained identical. These were made in Taiwan for Ibanez, but the actual manufacturer is unknown. Shown above - The Ibanez SF5 60'S FUZZ. The "poor mans OD-850". From the Soundtank series, made in Taiwan circa 1990-1999. Manufacturer unknown. Also called the Ibanez 5 series. 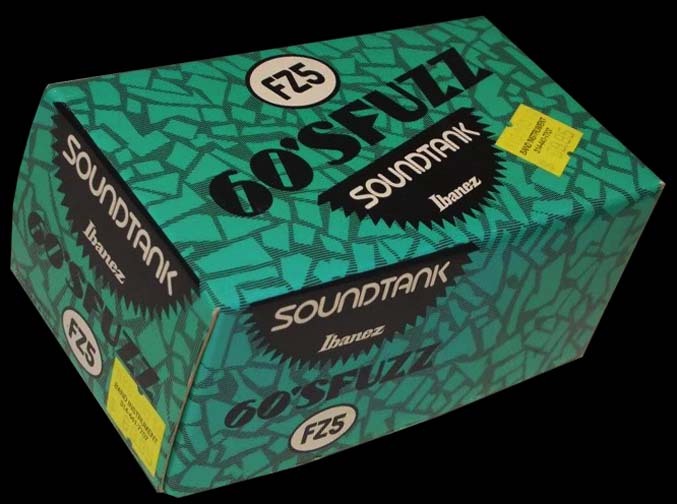 Soundtank was the Ibanez economy line, housed in cheap plastic enclosures, though the circuits were of high quality. 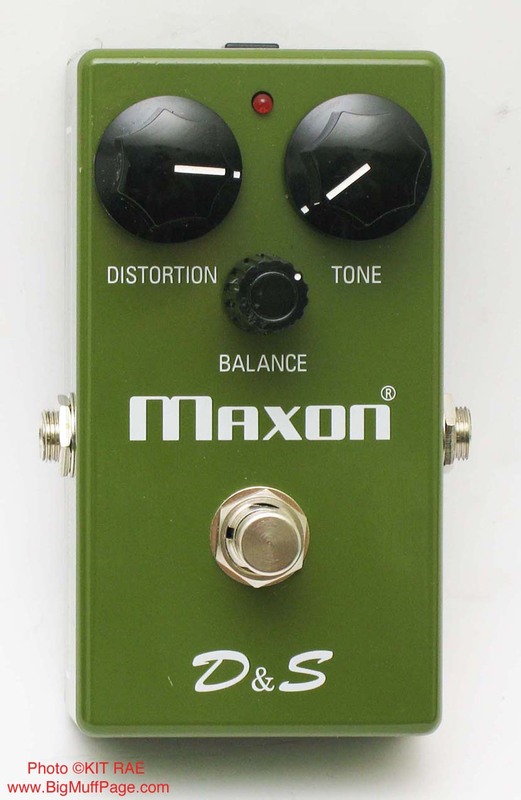 The distortion section of the circuit is similar to the Maxon D&S first edition Big Muff clone, and sounds nearly identical. 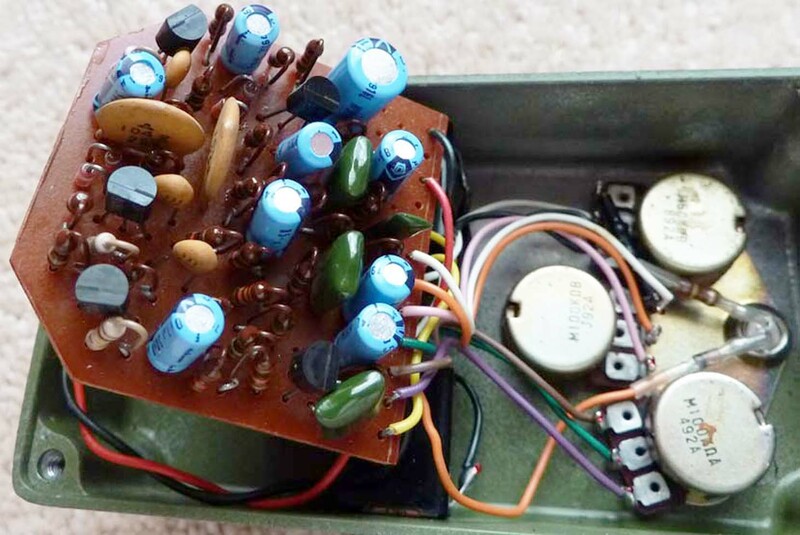 Includes a FETT electronic bypass circuit and buffer. Shown above - 1997 Ibanez advertisement featuring the Soundtank series. Click to see the full page ad.